Favourite Food? Mexican or anything with a bit of spice! Best Holiday? Cuba – it was paradise! Sun, sea, sand & rum! Go to Breakfast? Ulster fry – you have to have potato and soda bread with a fry up! Form follows function. That’s what was drilled into us on our various Interior Design courses. The essence of this, as every designer knows, is that the function of an object has a large influence on its form, or shape. The influence of design to improve the look (and therefore saleability) of everyday objects can be seen in just about every aspect of our daily life, even disposables such as food packaging. Much of this is down to the emergence over the last 20 years of CAD-CAM or computer aided design and manufacture, which makes the process of concept to reality, or at least to prototypes, a much easier ride than it used to be. Add the fairly recent bolt-on facility of 3D printing and the process becomes even simpler for some fields of design. 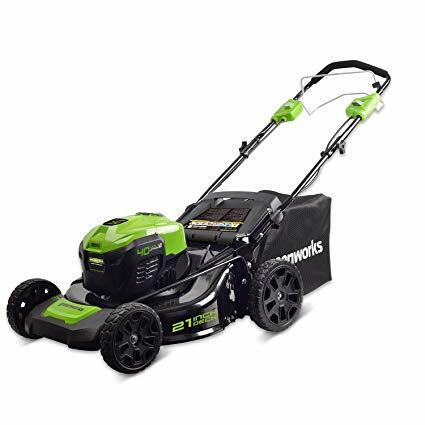 One of the clearest influences of this is in the vastly increased range of models, and model variants, available from motor manufacturers. 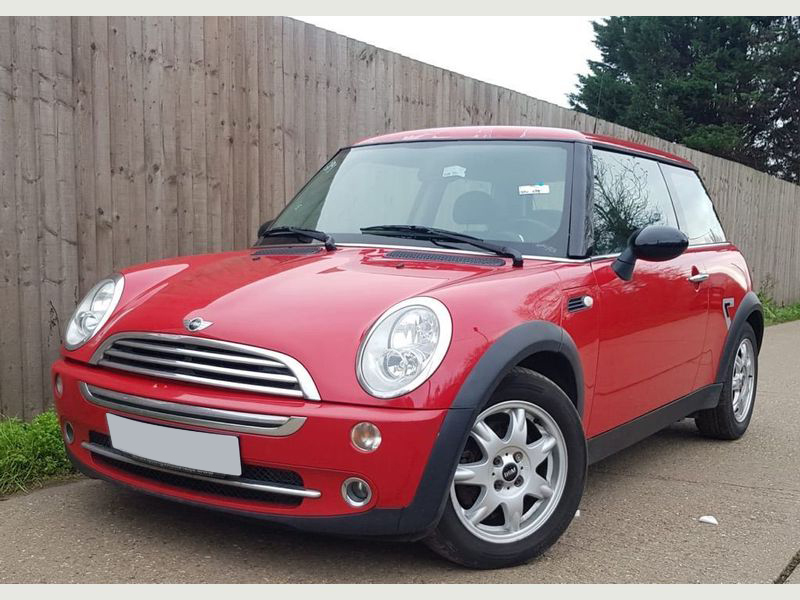 20 years ago you could probably choose from 5 different models from major manufacturers whereas today there are upwards of 10 with multiple, almost infinite variations (see BMW’s Mini for example). Tweaks to models happen on a yearly basis with slightly different light clusters and interior changes etc. Likewise we can see the influence of computers giving greater choice in our own field via furniture, lighting and carpet design, to name but a few. Form follows function hasn’t, of course, been ‘turned on its head’ it’s just that designers have become much more savvy about making functionality more attractive which has, in part, been possible due to computers being able to make those designer’s ideas a reality, and in double-quick time. The pressure on designers to come up with fresh, attractive new designs for every aspect of our everyday lives increases each year. Staying ahead of the curve relies on keeping up with influences in other areas of design such as fabrics, fashion and, more generally, colour trends (see our post on Coral as this year’s colour). This is something JMDA pride ourselves on and can be clearly seen in the many recently completed interiors we have produced. 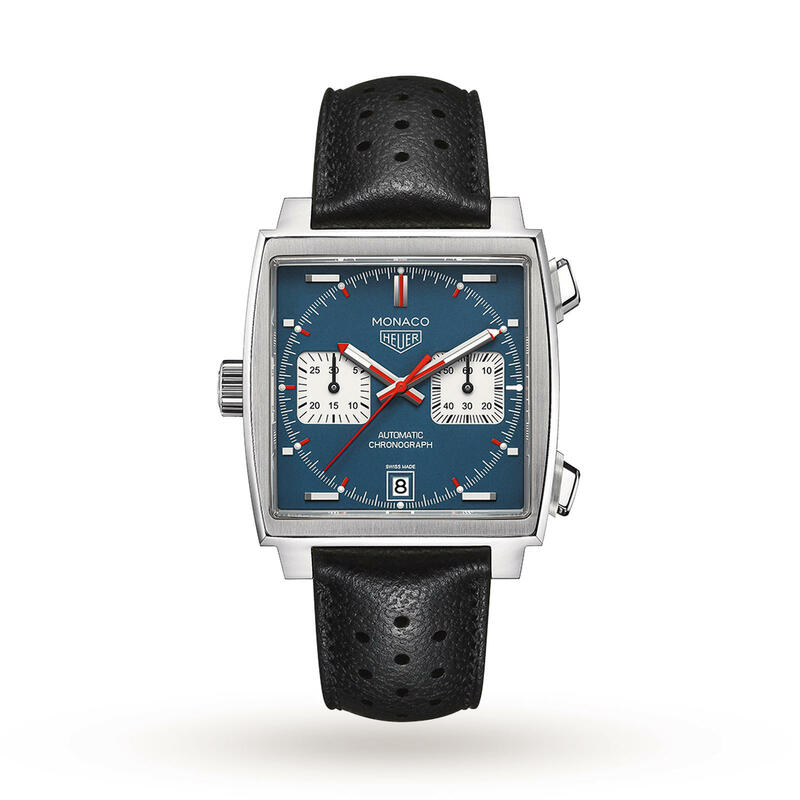 as well as watches such as TAG Heuer’s recreation of their Monaco model (made famous by Steve McQueen in the film ‘Le Mans’). 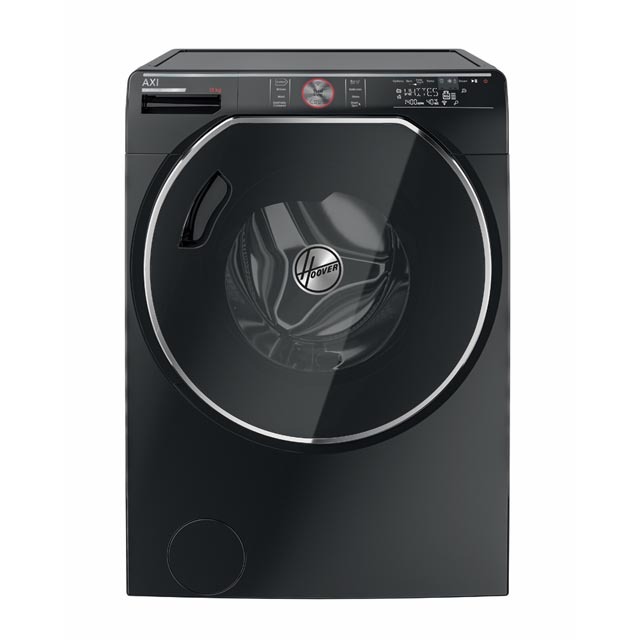 These models combine nostalgia with cutting edge tech which seems to be a winning combination. This influence can be seen in Interiors including our own with such examples as Cut & Craft in York which combines Art Deco influenced metalwork features. In consideration of the future of our industry, we have at this juncture, to at least consider Artificial Intelligence in the role of design. You may consider that Design may be one of the last areas of industry to be affected by this as it relies on the immensely complex process of our imaginations. But, with such advances as a computer (called Eugene, incidentally) passing a test devised by Alan Turing – the hero who cracked the Enigma code – to prove it can ‘think’ back in 2014, this assumption must be made with caution. It isn’t fanciful to predict it will not be too long before computers can be programmed with algorithms which mimic aesthetic considerations and, disturbingly, be then able to learn from this and produce advances in their own designs. Perhaps a couple of generations hence? Interior Design may present an added challenge in that it not only involves the aesthetic consideration of the various finishes and fittings of a room or space, but the functionality of that space as well. Maybe the combination of creating a mood as well as an efficient space will make Interior Design the last bastion of Human led design? We can only hope. Meanwhile, back at Reality Ranch, we use computers to trial designs which our clients can see and comment upon before they become reality, whether this be 3D images of products or, in our field, high definition, super-realistic renders of the interiors we have envisaged. It can be argued that, at least in some instances, the form follows function rule is almost finite. The mobile phone is a classic example of this with all manufacturers producing something of a similar size (due to the functionality of the human hand) and appearance (maximising the screen size with curved edges to the case, for example). Having said that, there are rumours of foldable, unbreakable Graphene phones being on the horizon. And we all know the distance to the horizon is much less than it used to be. 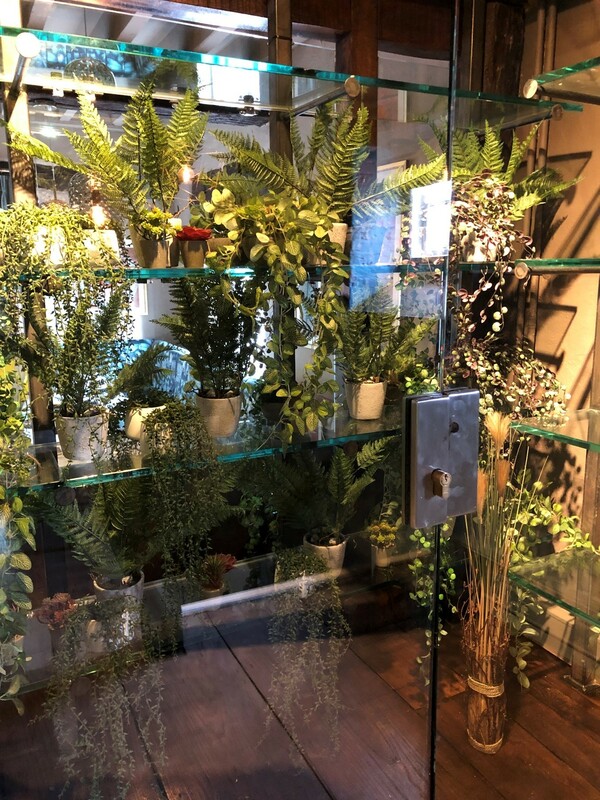 Chalky, white palettes and pale timbers, juxtaposed with modern furniture and the vibrance of green planting screams the one simplistic design trend almost everybody recognises; ‘Scandi Style’. Despite its appeal, having been replicated in many domestic and commercial schemes over the years you may question just how fresh and current the style is as we enter 2019, and whether it has further developed from its flat-packed form on the shelves of Ikea. Well, not only is it so much more than that – but it in fact fuels the design nucleus of one of the hottest Furniture and Light fairs in the creative calendar. Stockholm design week hosts a plethora of new, inspiring innovations in both residential and commercial interior design sectors; hosting talks on trends, sustainability, showcasing new products and materials from the 5th February to the 9th. Interestingly the fair unites the three Nordic countries; Denmark, Norway and Sweden – who’s historical background form the core of Scandinavian Design, and will house over 750 exhibitors, 900 journalists and visitors from over 100 countries during the week. Unfortunately we didn’t get chance to attend, (Handovers are calling!) However we thought it only fair to share a couple of our recent inspirations from all the buzz, and how they may influence the Scandinavian essences we add to some of our own projects here at JMDA. 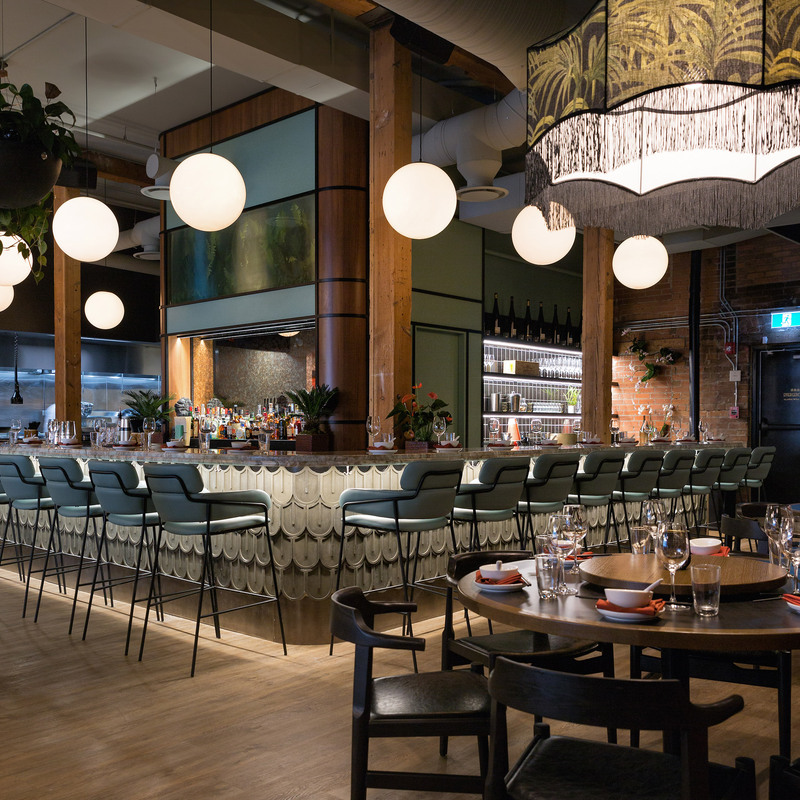 The Usine restaurant; a former sausage factory uses galvanized steel structures, blackened iron, flashes of accent oranges and a layout with functionality at the forefront of mind. Maple and marble line the table tops, glossy tiles clad the walls and the ceilings with archways to create magnificent height. Gastro O Restaurant situates in St Petersburg, celebrating a brutally exquisite example of just what Scandinavian design brings to a space. The design is functional yet exciting with clean lines, contrast of plaster and brickwork, patterned tiles and timber flooring. Flashes of colour are splashed throughout on fabrics and surfaces, and the smooth faces of such raw materials add a slick contrast. Inua, is a Scandinavian designed restaurant pulling Japanese culture and Nordic design twists into its interior. The space was stripped right back to the bone, and again introduces minimalistic materials and simplistic palettes into play. Foliage and the use of organic shapes created a link to the natural environment, creating an inside/outside feel. Many interiors combine Scandinavian elements with one twist or another; whether it’s Moroccan influences to something more punchy and eclectic, as it compliments so many schemes. Essences of Scandinavian design can be taken and diluted into practically any form of design project, and we at JMDA have certainly implemented a few over time. Whether its minimalistic furniture influences, the use of indoor spaces that bring the outside in, flooding light through glass paneling, juxtaposition of patterned tile aprons or use of rustic material and fabrics – it works. Scandinavian influences show prevalent in design choices without any awareness, illustrating why it creates such timeless style. We pulled our inspiration together to create some Scandi Style textural combinations, after feeling influenced by the rustic colour palette. Tiles, textured fabrics, timbers and timeless furniture that speak for itself are all elements we use day in day out at JMDA. 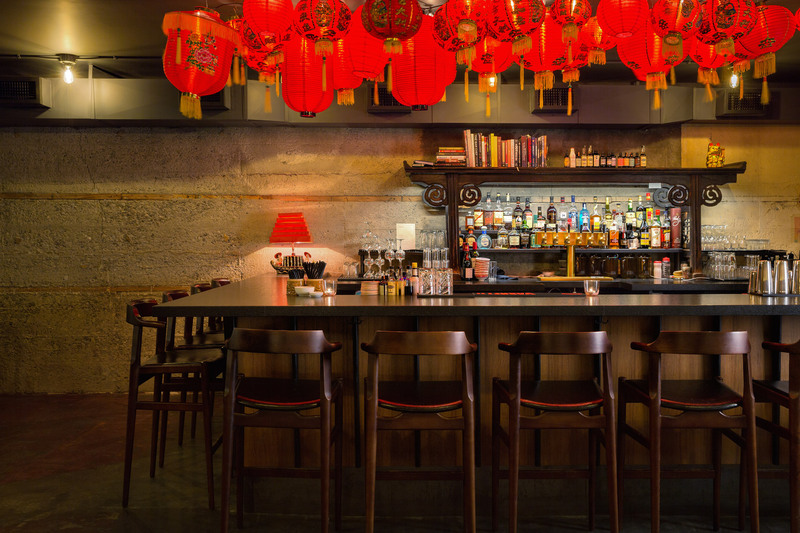 …A particular favourite of ours… Two Penny Chinese by Sarah Ward.. A restaurant and cocktail bar in Calgary, Canada. Taking inspiration from Shanghai in the 1920’s, where the art-deco movement merged with traditional Chinese motifs, the space celebrates the rich motifs and colours. A colour palette consisting of soft teals and dusty pinks are found throughout the space along with warming tones of terracotta – all a representation of this beautiful era. The designers have paid tribute to the common traditional Chinese architecture with features such as the circular moon gate which guests are greeted with upon arrival. Through into the restaurant, the true architectural representation is present with fluid lines within joinery pieces and curve-backed wooden chairs and fixed seating. The attention to detail on the waiter station is admirable with the soft curved lines and delicate wicker caning inserts complemented with pastel hand-glazed green tiles on the wall laid in a typical art deco shape. A true Chinese representation is carried on throughout the guest journey with feature walls covered in scrolls with large Chinese masks and decorative tiling laid in a way to evoke armour and dragon scales. 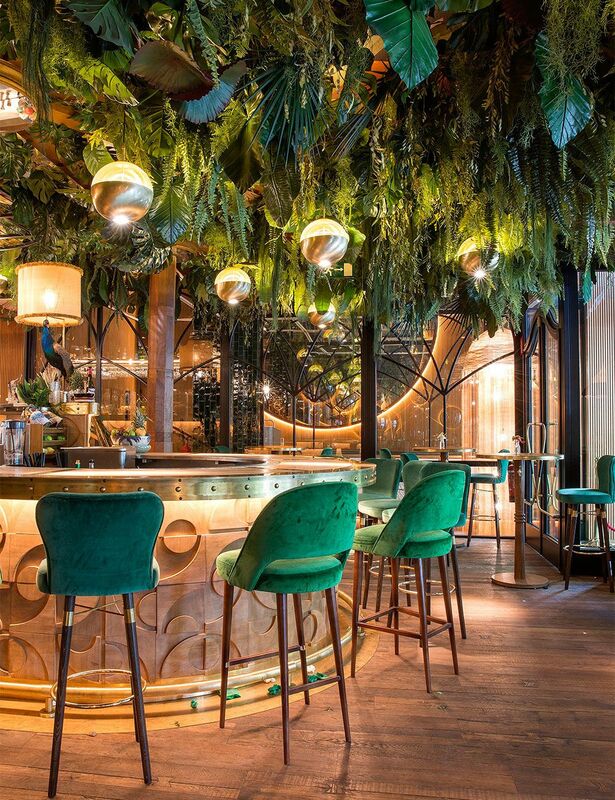 The suspended live planting and fringed pendant lampshades covered in leaf motifs are a JMDA favourite along with the beautifully carved bar front tiles! The transition through into the cocktail bar has been designed to create a contrasting atmosphere in comparison to the restaurant area. Reminiscent of dark alleys, the space consists of dark ceilings, exposed plastered walls and atmospheric filament lighting. When it comes to hospitality, it is crucial to consider the individual at the centre of the design. How they participate with the interior and their induvial perception upon these experiences. 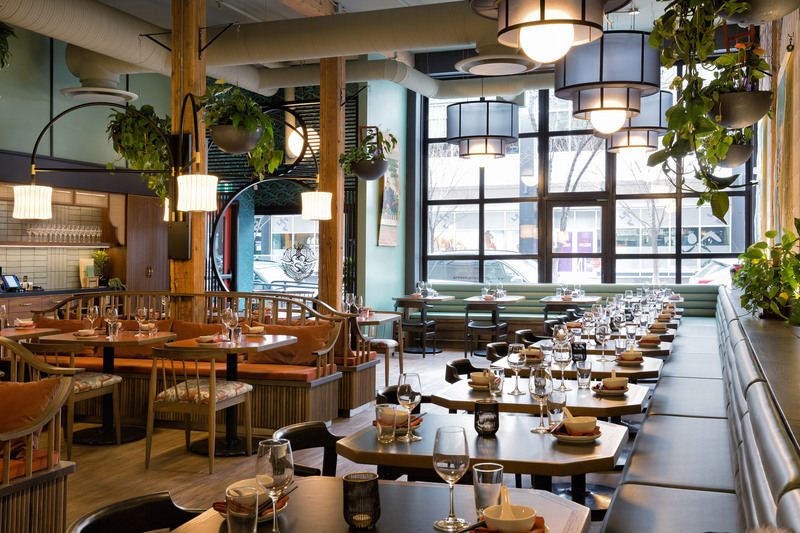 Whether it’s fine-dining or a casual drink; design can influence the users’ connection and interaction with the space. 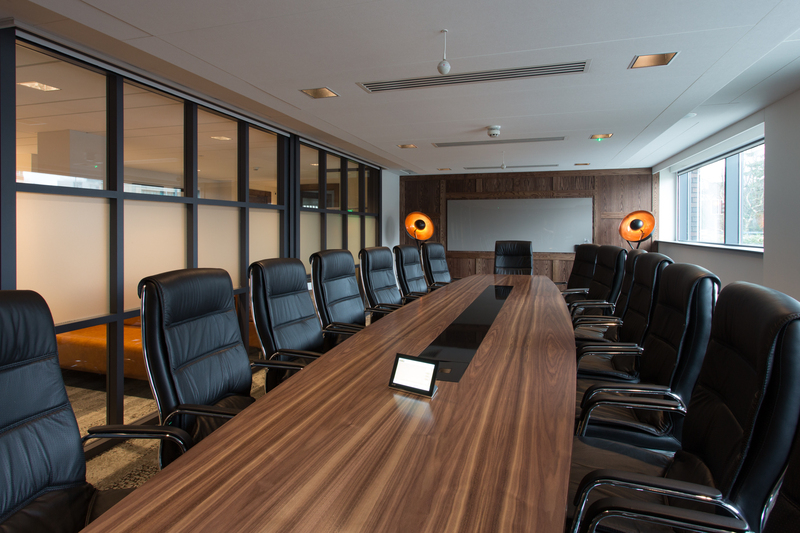 To ensure a memorable and individual experience for each user and a submersed connection with the space, it’s always worth taking a risk and creating interiors that WOW! Whether it’s a fluted detail to a wing back chair, a brass trim to a bull nose bar top or fringing to spruce up a stool, making a statement in the smallest of details is key. We make sure that every little element is considered to ensure that the finished design oozes quality! Metallics are indicative of luxury and prestige. Brass and bronze create feature surfaces which can instantly look sleek and premium. Embossed and laser cut metals can transform flat surfaces into beautiful statement pieces, whilst adding a brass trim can add extra oomph to a table edge or timber panelling. Rich colour palettes and textures are key in opulent design. Think Martin Brudnizki! 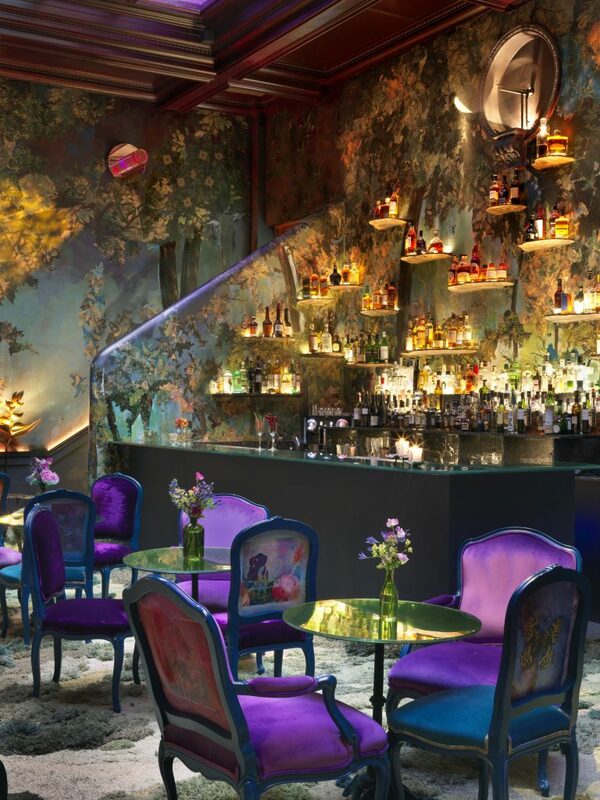 Vibrant colours, reflective surfaces and deep, moody tones create glamourous and alluring spaces. 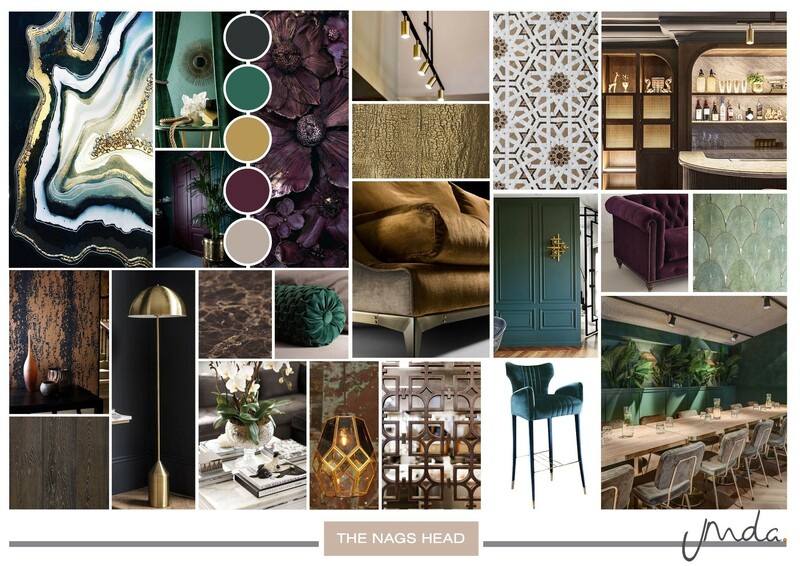 Plush velvets, bold patterned fabrics and lavish leathers against dramatic wallpapers and smoked glass light fittings create an eclectic mix of elements that have depth and energy. The design doesn’t need to be in garish and over the top. The trick is to convey a sense of luxury through the details whilst keeping it subtle and sophisticated. 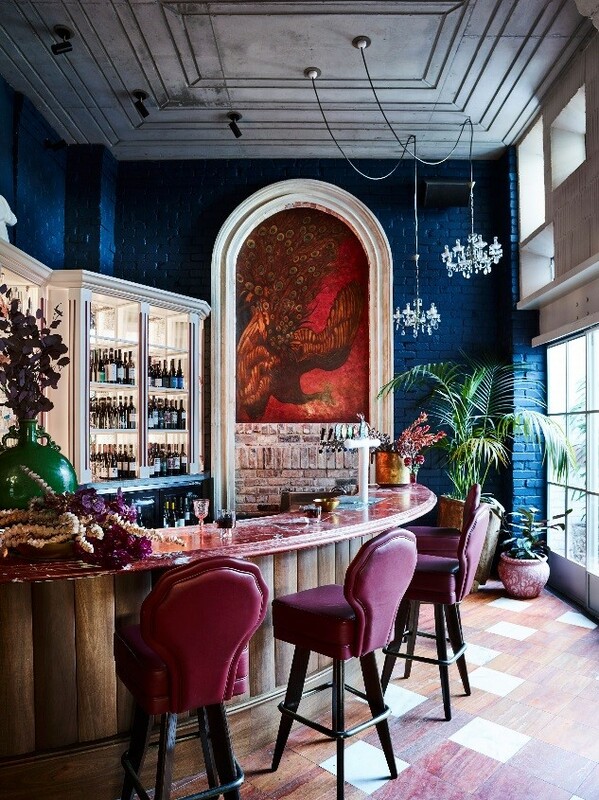 The Imperial, Sydney by Alexander and Co takes a different approach to opulent design. Rich, bold furnishings sit against raw and unfinished brick walls, capturing the character of the existing building. Each dining space evokes a sense of tasteful luxury, without overpowering the real beauty of the building. The lounge areas feel more intimate, with sumptuous velvet sofas, tasselled chairs and fringed lampshades that ‘accessorise’ the rich timber panelled backdrop. 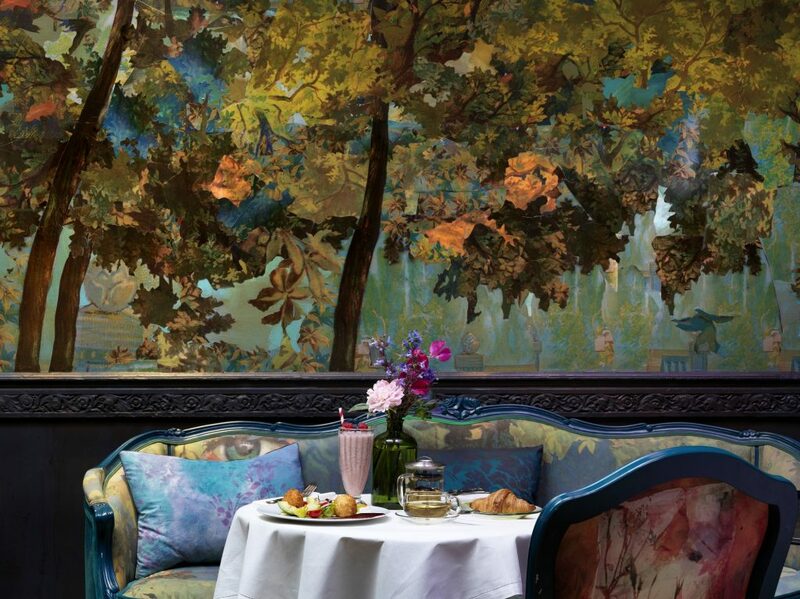 The second-floor eatery boasts extravagant finishes and hues of pink and royal blue. Oversized bar stools sit against the timber cladded bar and a bold and impressive wall mural draws focus through the space. The ornate back bar and ceiling panelling add a classic touch to this otherwise contemporary design, whilst the exposed building carcass brings the history through, adding charm and character. 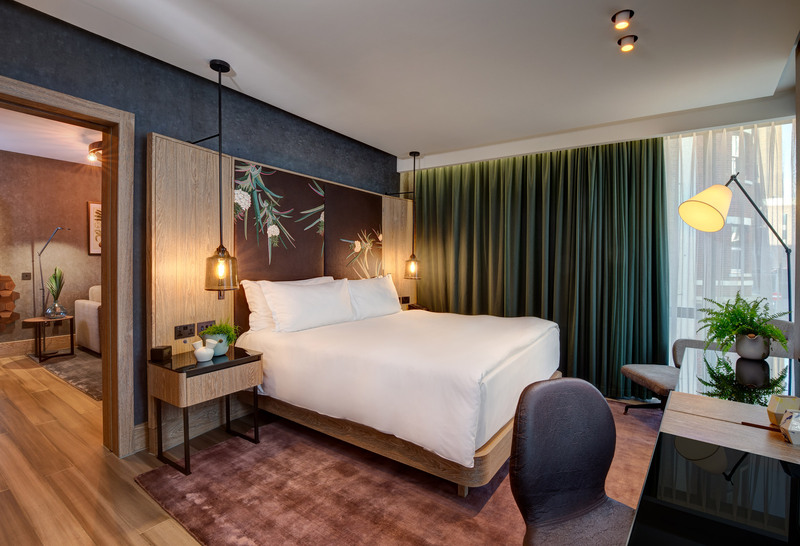 The world’s first vegan hotel suite opens in London! 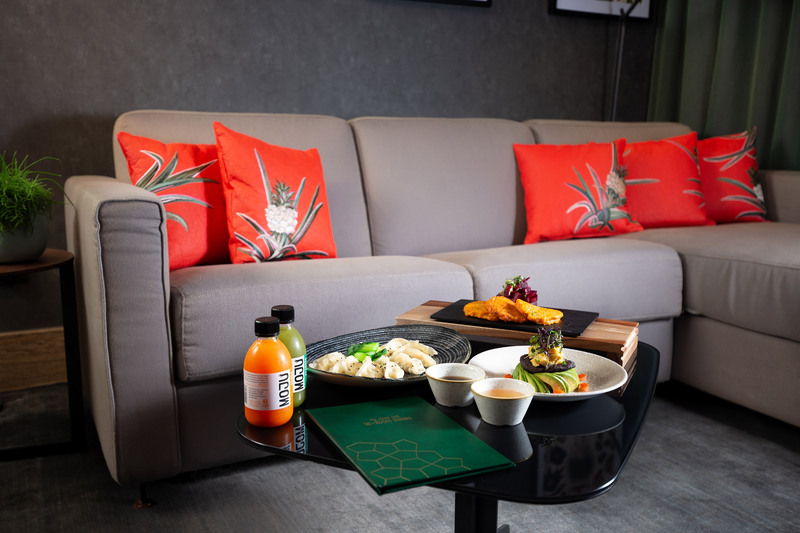 According to research by the Vegan Society partnership with Vegan Life Magazine, the number of people identifying as vegans in the UK has increased by a whopping 350%, so its no wonder the world’s first ever vegan hotel suite has opened in London! Even the entire selection of toiletries, snacks, drinks and cleaning products are 100% free of animal products, too. Goodbye minimalist; hello bold and exciting maximalist! Designers have spent years committing themselves to minimalist design, focusing on functional furniture & interior objects. Function over form. Using geometric shapes in a combination of no more than two basic colours… exciting, no? Don’t get me wrong, there’s always a place for neutral palettes & simple materials, but it appears we have taken a design U-turn… Minimalism and Scandinavian design are taking a back seat & are making way for powerful hues, bold prints & colours you only dared to keep in your wardrobe! Our designers at JMDA have been mixing patterns & textures for a while now. Some may say we are ahead of the game? But all that aside, we thought we would share a few of our projects, along with tips & tricks to help you become the maximalist masters you truly are! Be brave & don’t be scared to layer bold colours. Start small & work with two colours you love.Use your chosen colours subtly within fabric choices & decorative art to really make the room POP! Create statement features & gallery walls by layering different patterns & textures. Creating a maximalist space is all about the interplay of design elements to give a sense of richness & texture. It is sure to catch everyone’s attention…without overwhelming the guest! Who says you can’t keep it neutral without making a statement? 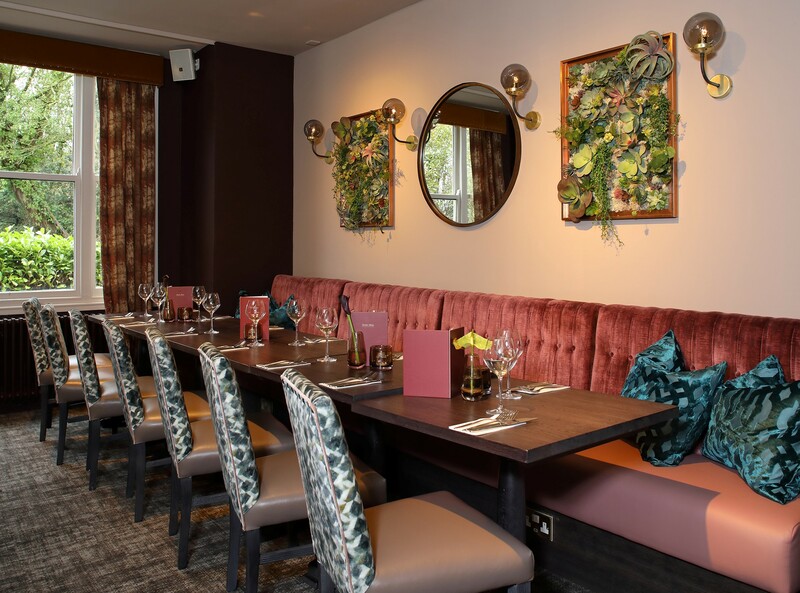 The Alexandra in Wimbledon is a great example of how the use of natural coloured wall paper in a statement print pattern can bring a space to life. 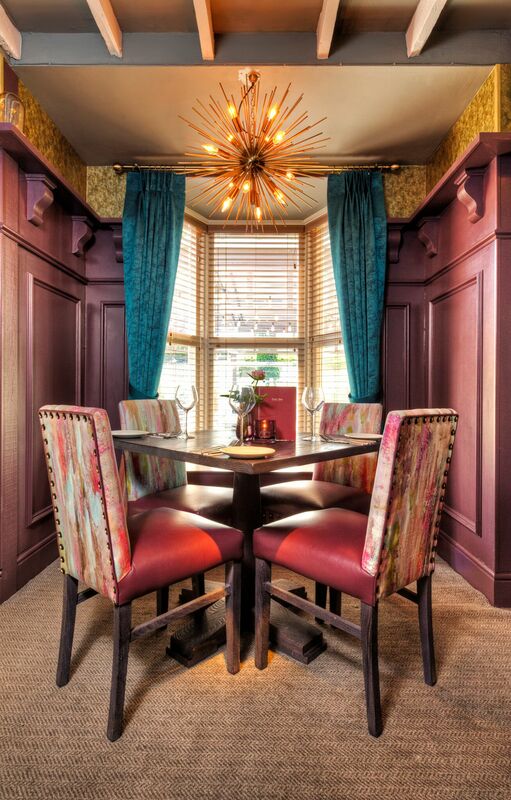 … taking affordable dining to the next level, offering a stylish and contemporary setting in the heart of the beautiful and historic city of York. 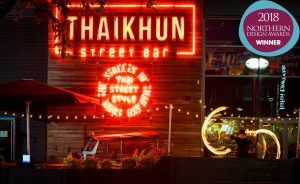 JMDA are proud to have been awarded 1st place for Interior Design Project 2018 < 250k with our recent design for Thaikhun Liverpool! We are extremely passionate about what we do and it is reflected in our work. All food. Can I say that? I suppose if I could only eat one meal again for the rest of my life it would have to be Thai! 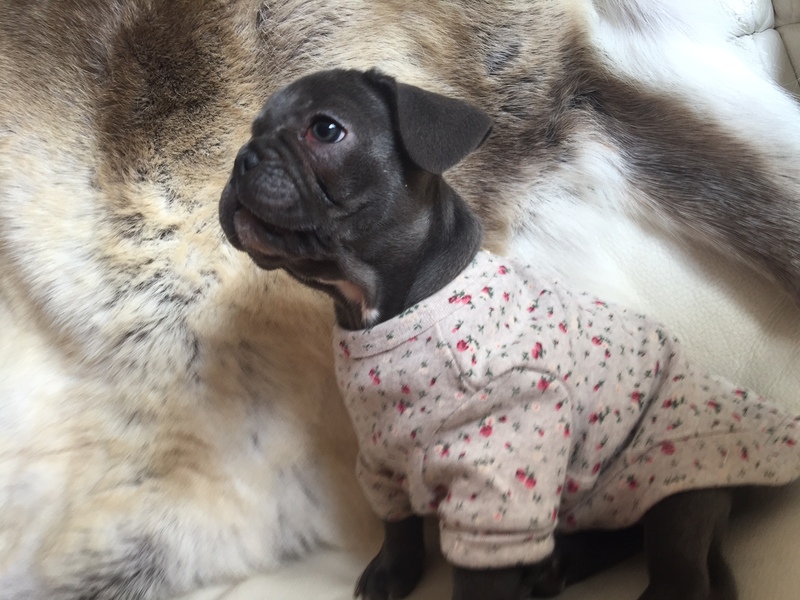 Rosie will be embracing the city lifestyle & bringing a fresh perspective to the Leeds studio. 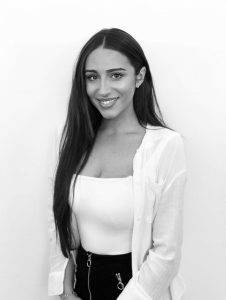 She joins an already established team with a wealth of experience and some interesting projects to get stuck in to. Favourite Food? Anything with pasta and lots of cheese!! 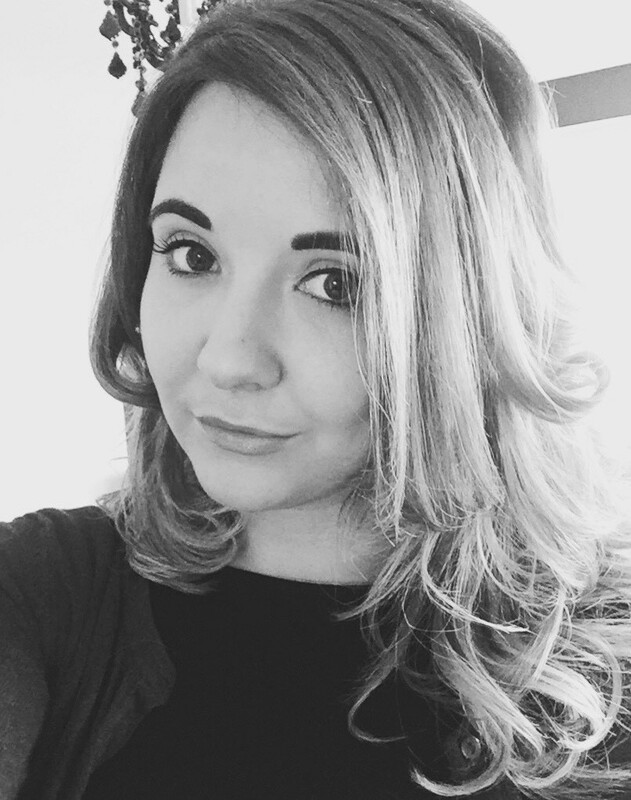 Jess will be heading up new developments & prospects within the company. 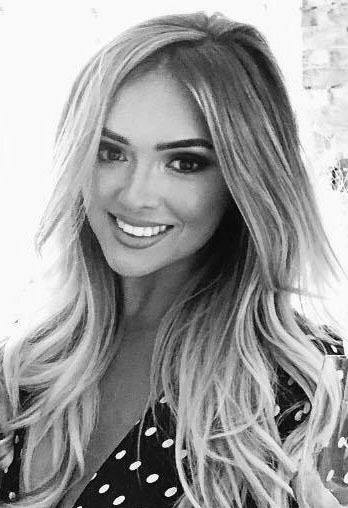 She will be out and about meeting clients, suppliers and gathering new leads for our ever expanding business. So if you see her on her travels be sure to say hello and keep in touch. Favourite Sport? To play… Netball. To watch… nothing! And finally what’s your Guilty Pleasure? I love pork scratchings! 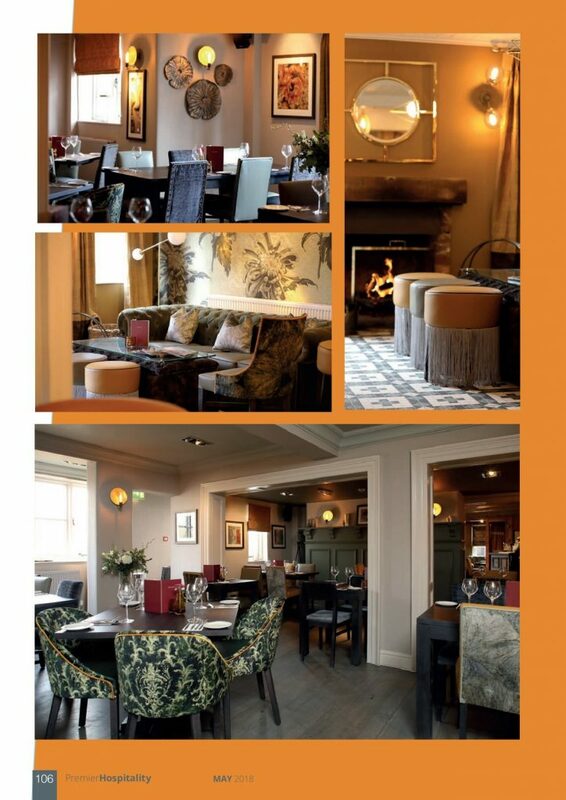 The Fox, Harpenden is a true representation of the Premium Country Pub brand for Mitchells & Butlers. 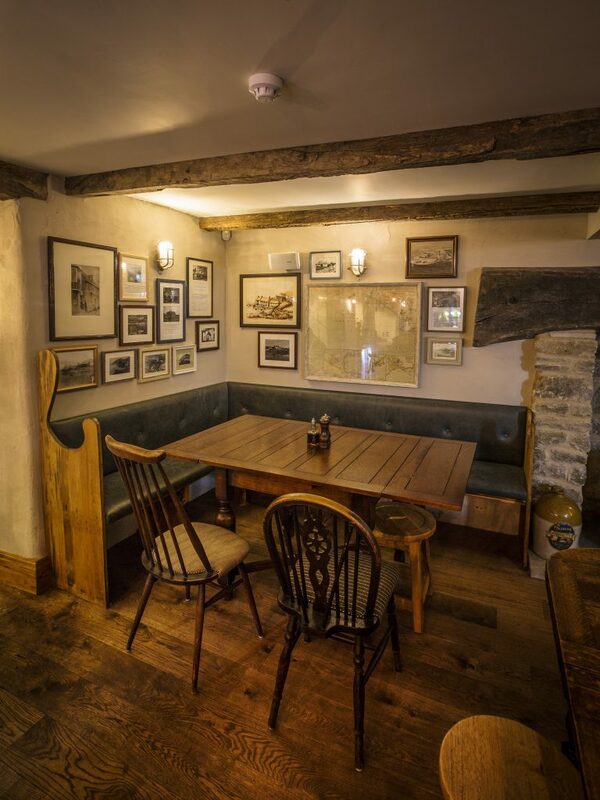 JMDA recently refurbished this site and converted it into a welcoming and memorable country pub that oozes historical charm and is the ideal retreat for a variety of food and drinks; cocktails being our desired favourite! 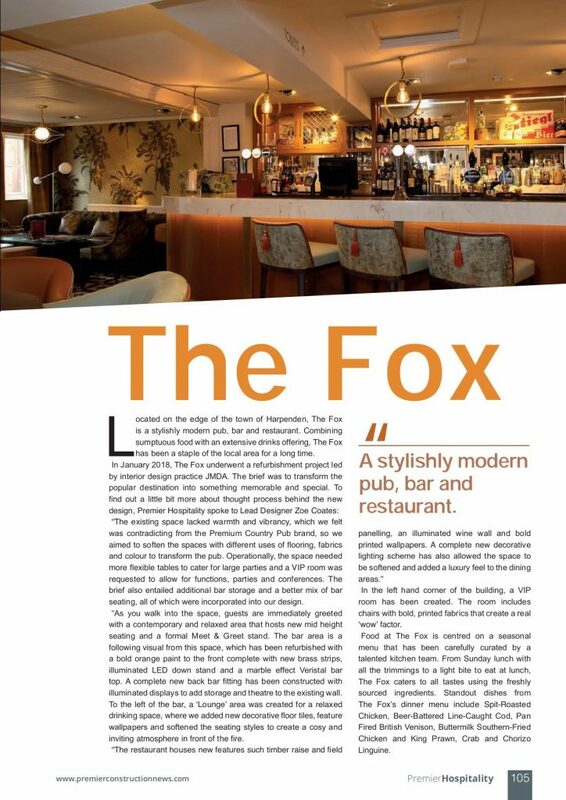 We were delighted when Premier Hospitality Magazine featured The Fox in one of its latest publications, which discusses the brief and how JMDA worked to transform the site both aesthetically and operationally. An autumnal pallet was implemented alongside inspiration driven from a woodland fox; accents of oranges and greens compliment icy blue tones to create a warming and inviting setting (not so warming at a snowy handover!!). With the option to hold 126 guests, the site now features a new VIP area for larger parties, increased dining and bar drinking areas and a new lounge area. Softer furniture including sofas and upholstered coffee tables have been included for guests to enjoy and have enhanced the natural charisma of the site. Printed plush velvets are used throughout the site along with a new bespoke lighting scheme complete in antique brass. 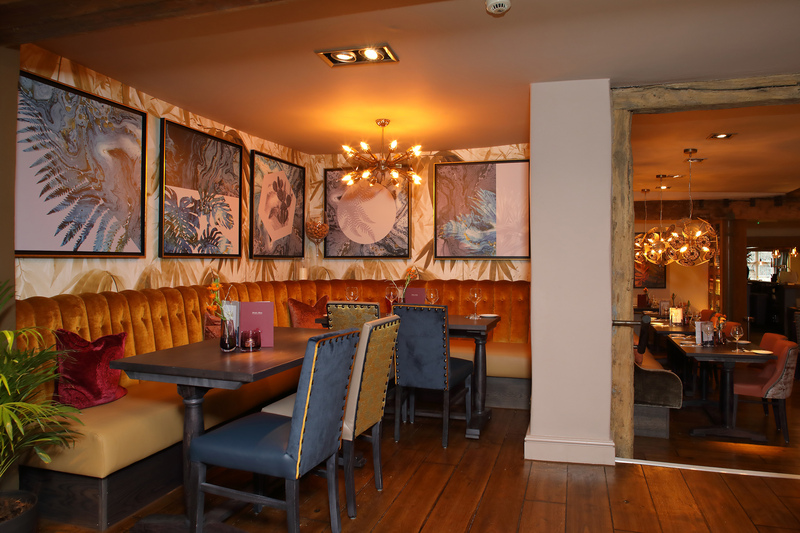 Finishing touches such as artwork, wall coverings and internal planting fall back to the woodland fox concept, a personal favourite being the character heads of the promiscuous fox. Talk of the town… our latest local project is revealed! 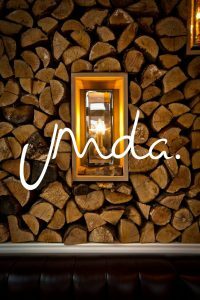 JMDA are currently working away behind the scenes on an impressive new Steakhouse concept for local restaurateurs currently operating in York, Harrogate and Beverley. 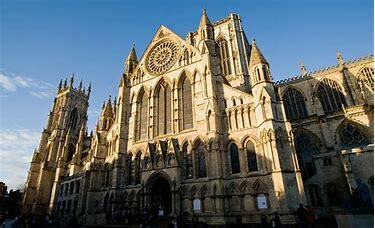 As the project ramps up the team are getting more excited to see the concept come to life in JMDA’s hometown of York. Situated in the heritage area of Sampson Square, JMDA have dug deep in the archives to create a concept driven by heritage, royal jewels and the famous ‘Battle of the Roses’. Serving Steak and Craft Ales, the restaurant will house 142 guests and will be host to a lavish central bar dressed in rich blue tiles grazed with lighting and topped with an oxidised copper top, serving cocktails, ales and wines. 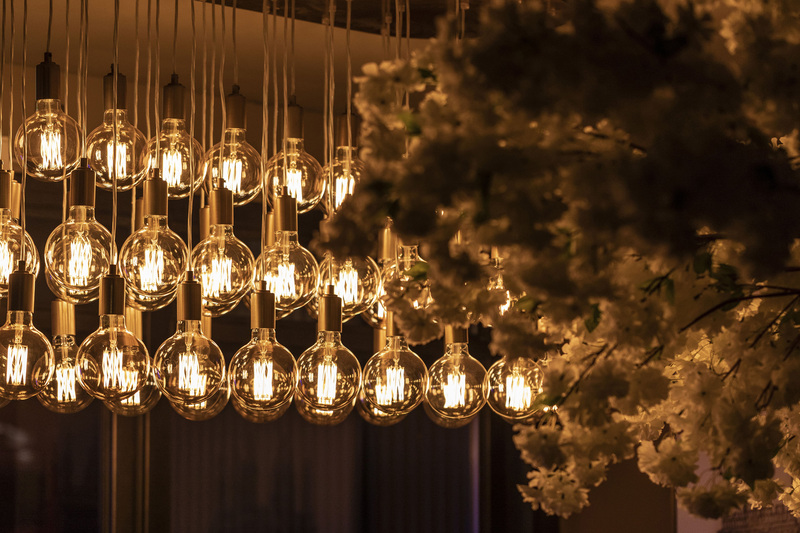 An impressive lighting feature within the bar will showcase the heart of the restaurant. As the circular radius of the bar expands across the space, the dining areas begin to take shape, from intimate mid height two cover tables with timber screen protection, to large party dining booths. A feature stair case constructed in timber and steel will be juxtaposed with an elegant sky lantern, neon signage and brass metal work to the existing brick of the previous retail outlet. The design will also feature an open kitchen pass which will showcase the chef’s skills and the quality of the products. Sight lines are kept clear throughout the space in order to create ‘food theatre’ seen by all, an element that is key to the brand development. It’s not only us who are excited about the design, Insider Media Ltd have recently featured JMDA and the proposed scheme in the article below. We can’t wait for a team night out once it’s opened, keep looking on our website for the big reveal! 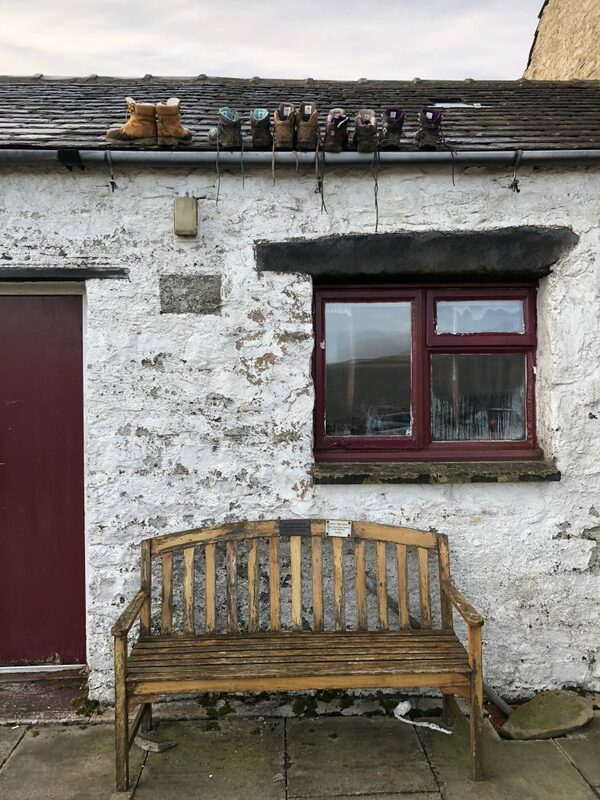 The Yorkshire Three Peaks Challenge… to the top! JMDA’s latest challenge featured three peaks, torrential rain, lots of mud and plenty of blistered feet!! 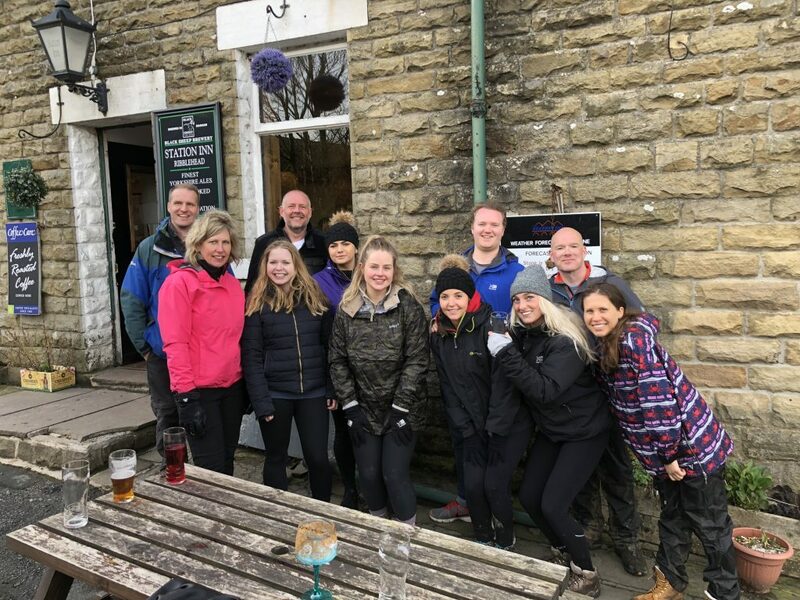 The Yorkshire Three Peak’s was JMDA’s latest team bonding exercise and, although the faces at the end didn’t show it, we secretly think everyone enjoyed it! 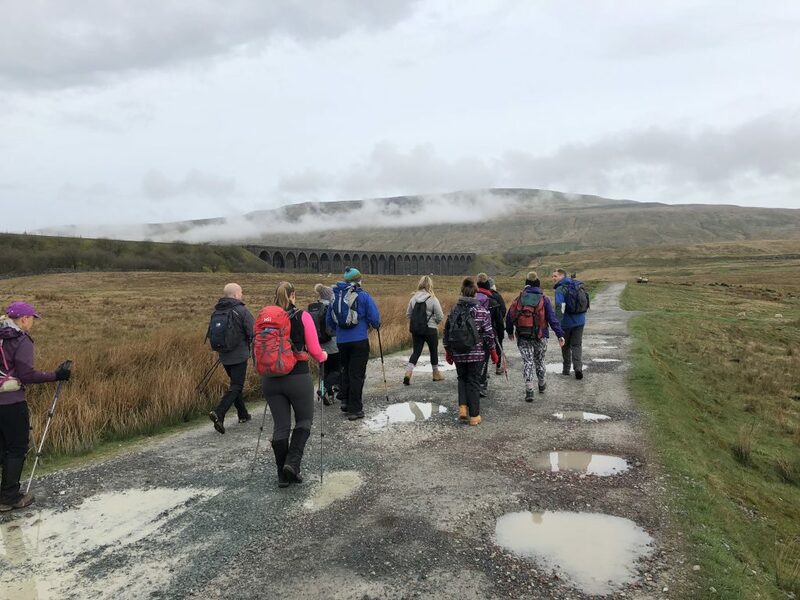 The challenge consisted of three peaks over 24 miles; Pen-y-ghent, Whernside and Ingleborough with a task time of under 12 hours. 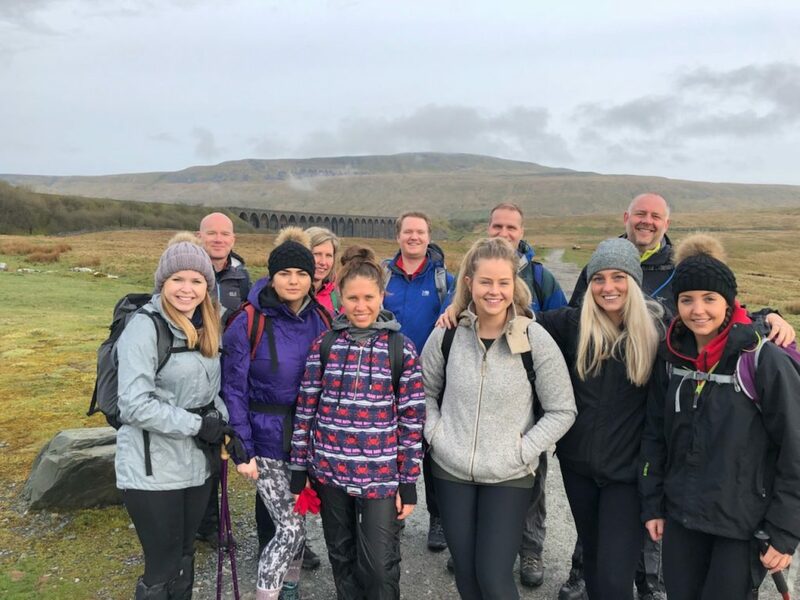 Up for the challenge, the team set off up the biggest (Whernside) at 8am and you can see by everyone’s facial expressions the anticipation was eating away at them! Throughout the day we saw a couple of broken soles (and souls! ), swollen hands and plenty of perspiration (and perseverance!). JMDA are currently planning their next challenge, any ideas are greatly welcomed!! And just like that.. we are on TV! Another week, another feature for JMDA! This time JMDA have featured not once, but twice on our television screens in the past week. Alec’s eye for detail hasn’t gone unnoticed as he spotted some of our recent work in the latest episode of The Jamie & Jimmy’s Friday Night Feast and the last in the series of The Undateables. 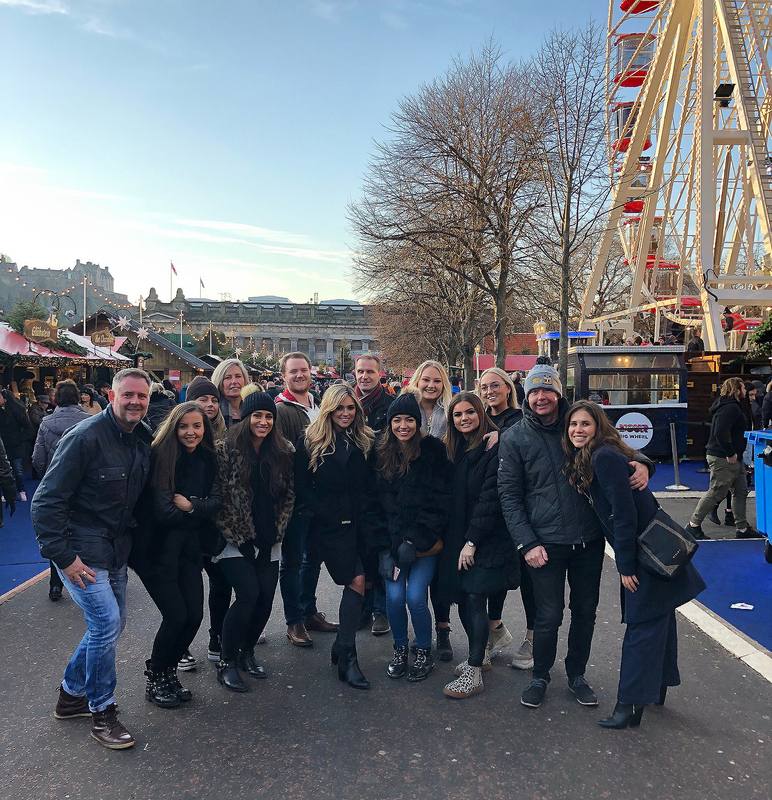 What a treat is was to see our work through the eye of the TV… The Undateables featured The Corner House in Cardiff which is one of our favourite jobs so far for Mitchell & Butlers and the Tree Top Adventure Golf in Cardiff. The Undateables is one of those guilty programmes, you shouldn’t love it, but you do. 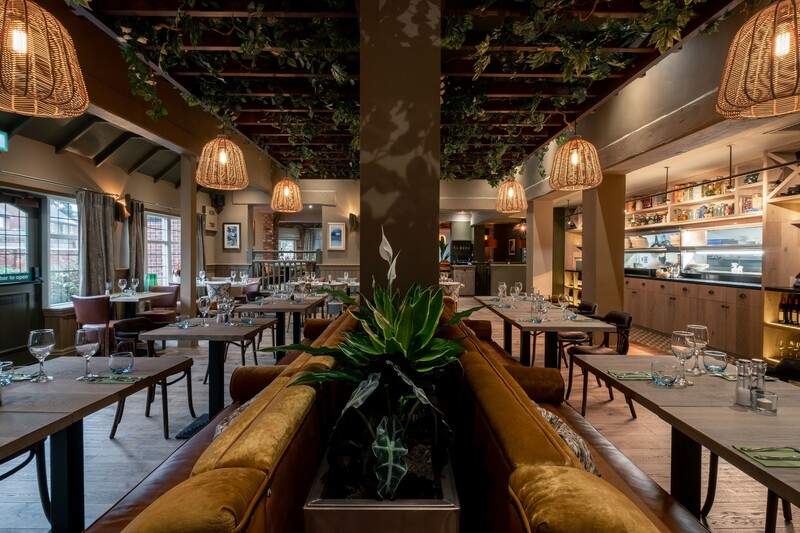 However, there is a lot to love about the Corner House in Cardiff; bespoke artwork pieces showcasing the city landmarks, statement fabrics both on feature chairs and fixed seating, and complimenting bric a brac to suit. 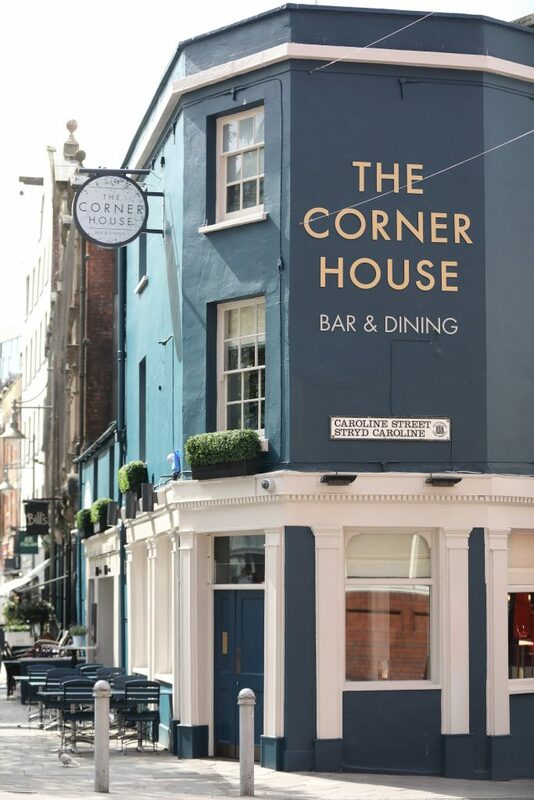 The Corner House is the ideal setting for any date night and we aren’t the only ones to think so! 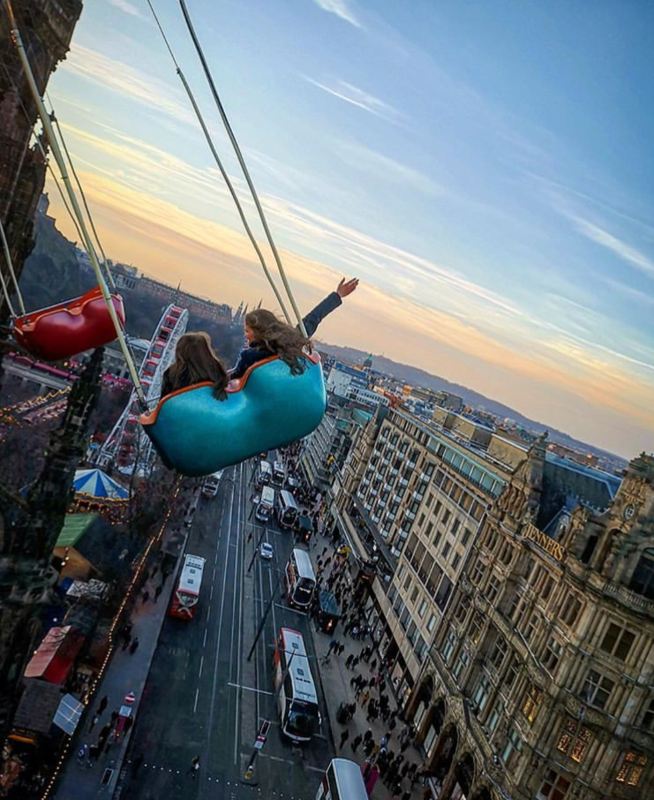 The Tree Top Adventure is also a pretty cool hang out spot in Cardiff, with levels of themed golf courses to test even the professionals. 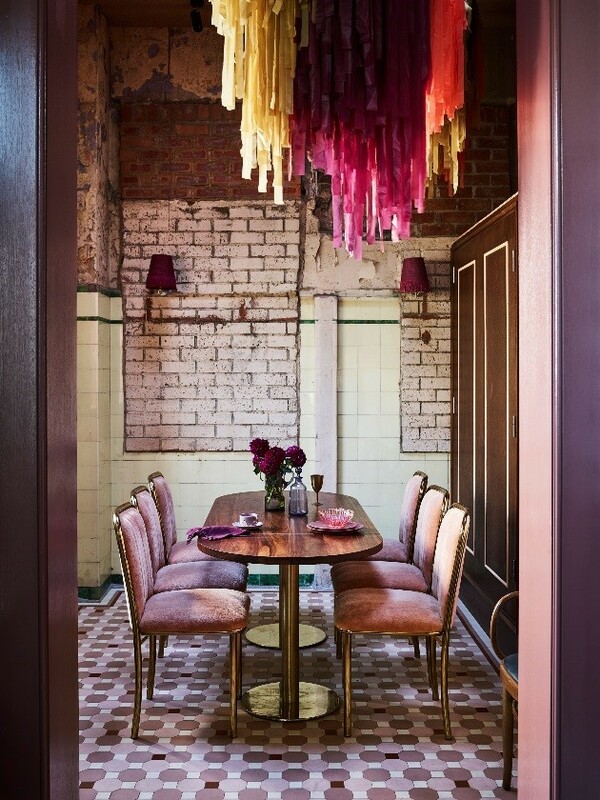 The rustic Brazilian interior hosts a variety of textured materials, a bold colour scheme and some modish furniture. Jamie & Jimmy’s Friday Night Feast featured The Anchor Inn, a recent job for Palmers. Jamie and Jimmy cook mouth-watering dishes alongside guests; Craig David being the latest feature. The Anchor Inn is the ideal seaside spot for any couple with natural, earthy materials making you embrace the local surrounding. The nautical theme was carefully considered with subtle hints in the light fixtures, framed art work and soft furnishings. 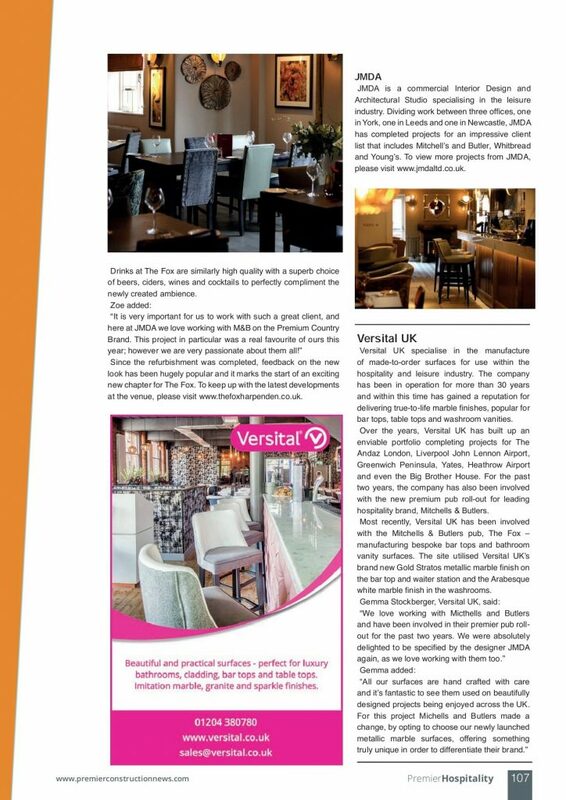 It’s always great to be featured in one of the leading hospitality magazines! 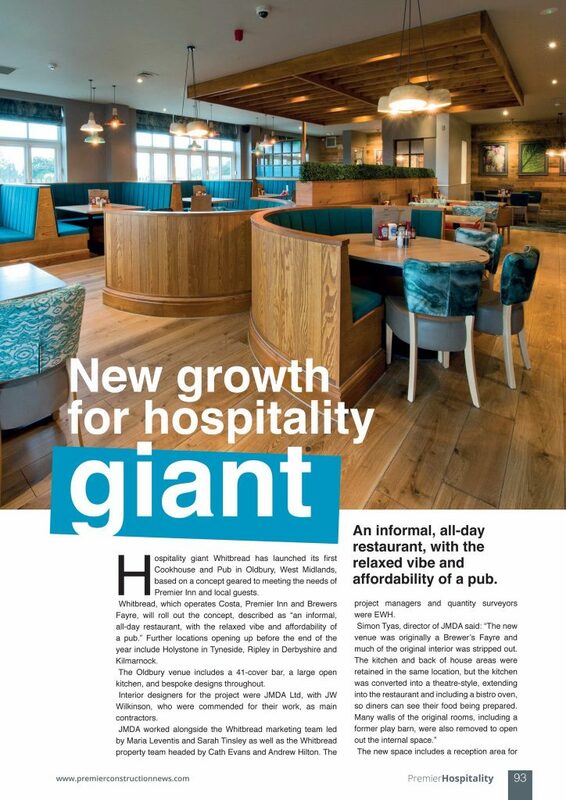 JMDA’s recent partnership with Whitbread has been featured in the latest Premier Hospitality magazine; discussing the new concept and design. 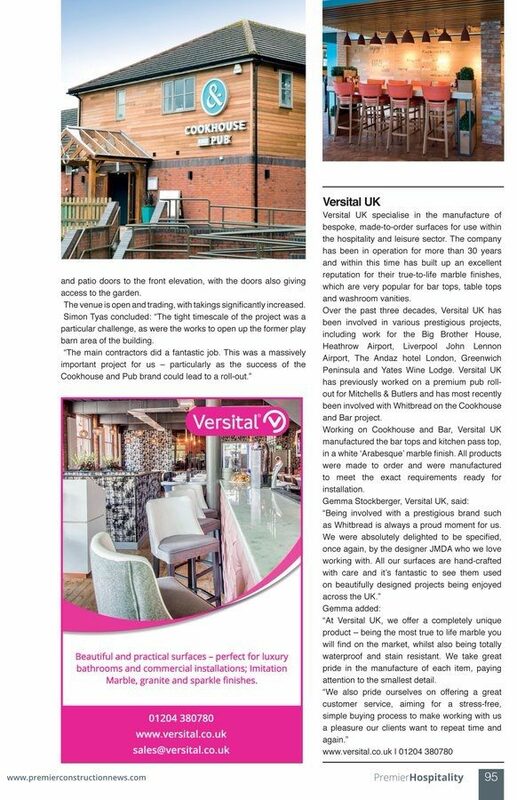 JMDA are continuously growing the new Cookhouse & Pub brand and with some more secured sites in the pipe line, it’s always a treat to read about there success. Cookhouse & Pub’s exciting new design elements have carefully been considered to offer a great alternative for the everyday individual. The brands new identity is all about the hearty, homemade, natural feel and this is portrayed through a theatre kitchen, exposed brick work, feature walls with chopping boards and hand stencilled stories – your typical pub classic; a cosy fire! The attention to detail is prominent through the sites with bespoke fabrics which are co-ordinated with pops of accent colour and cheerful light fittings. 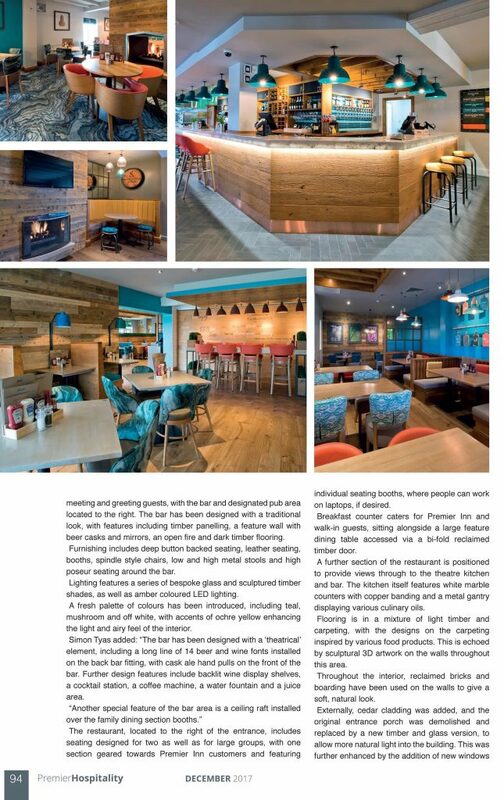 JMDA are looking forward to continuing their relationship with the Whitbread team and everyone involved on the new Cookhouse & Pub brand, check out the article for yourself…. With Christmas done and dusted we would like to wish you all a healthy and happy 2018! New Year has kicked off strong for JMDA with site visits, new concepts design and nitty gritty detailing!! Leeds office had the pleasure of welcoming a familiar face from the Mitchells & Butlers team; Stuart Tucker. 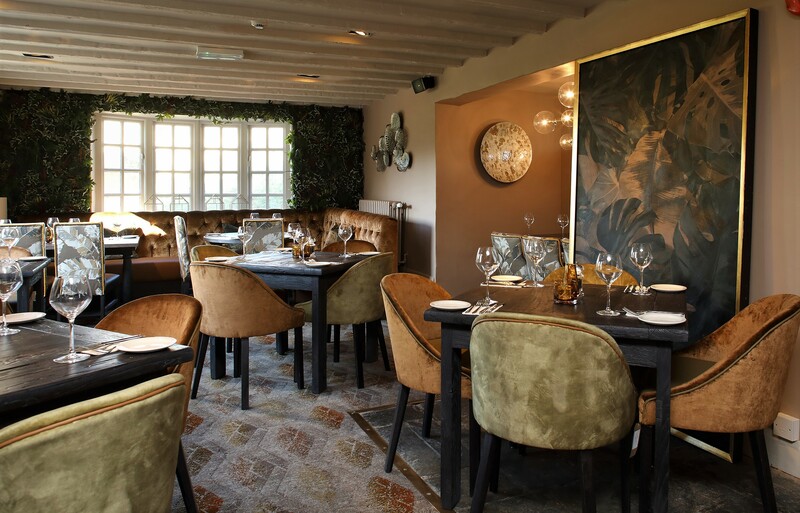 JMDA have been working with Stuart and the rest of the team now for over two years on their Premium Country Pub brand, developing a great relationship with everyone involved, which has resulted in a portfolio of successful projects. 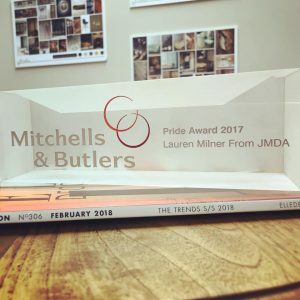 This year Lauren Milner and the rest of the JMDA team have welcomed the Pride Award from Mitchells & Butlers. 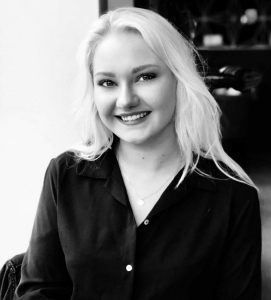 Lauren’s dedication and commitment to the company has been noticed by the Premium Country Pub brand resulting in her bringing home the award on behalf of the team. A glass etched brick addressed to Lauren and the team will take pride of place in the Leeds office and will be a great reminder of the success of the past couple of years. Overwhelmed by the surprise JMDA headed for lunch with a glass of bubbly or two to celebrate and settle the hysteria. 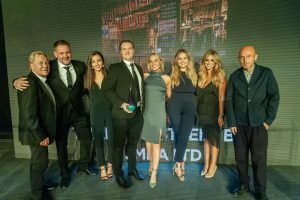 This award’s highlights the hardworking ethics of the ever growing team and the team’s ability to deliver and develop with the client… we take great pride and honour in receiving this award, as we do with all our work, long may it continue. 2018 we are ready for you!! 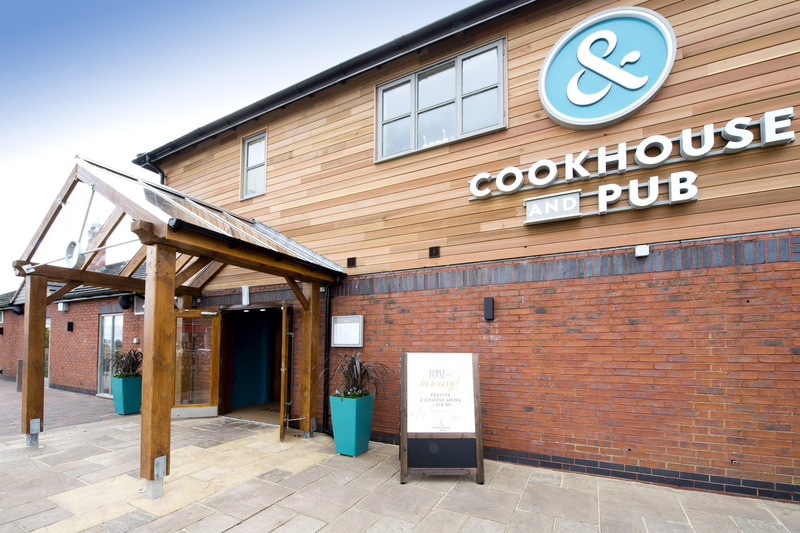 Last month, Whitbread launched its newest brand, Cookhouse and Pub, at its first site in Oldbury. The new venture aims to re-invent the pub dining experience, providing the quality food and service of an all-day informal restaurant, combined with the relaxed vibe and affordability of a pub. As such, an innovative new take on a traditional formula required a suitably innovative interior design: one which JMDA was excited to be challenged with. 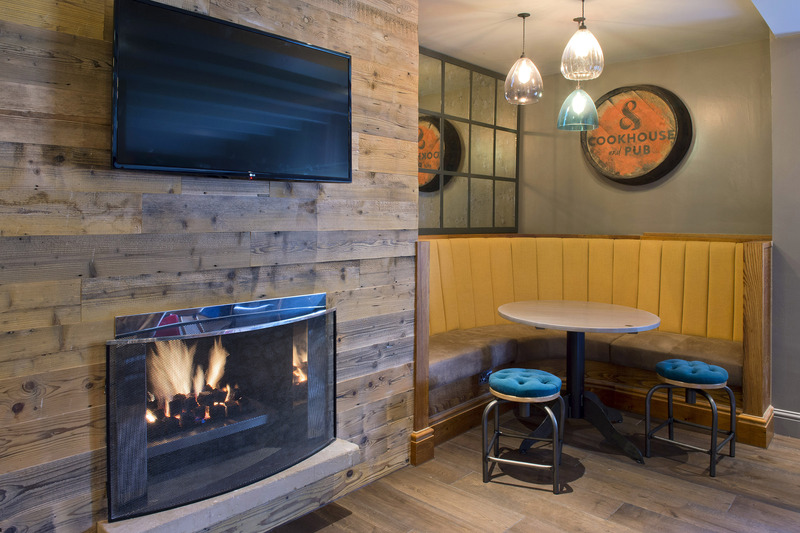 With an impressive 4,519 square-foot site to make use of, the interior of Cookhouse and Pub was designed to uplift traditional gastro-pub decor with fresh, bright colours and plenty of natural materials. Rich, honey-toned wood forms the backbone of the site’s scheme, accented with a consistent palette of vibrant orange and cool blues. 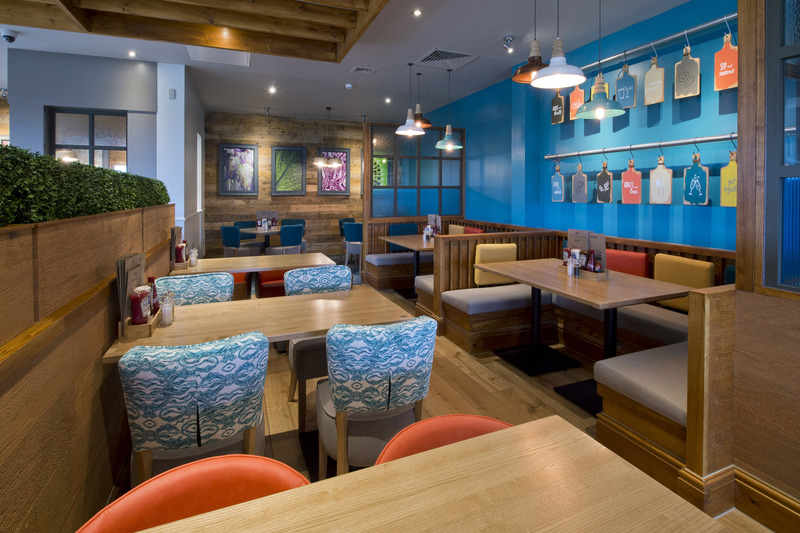 As an all-day venue, the interior of Cookhouse and Pub had to support a variety of uses. Plenty of open space allows for flexible seating arrangements, whilst the orange and blue accents preserve the mood through both daytime and nighttime service. 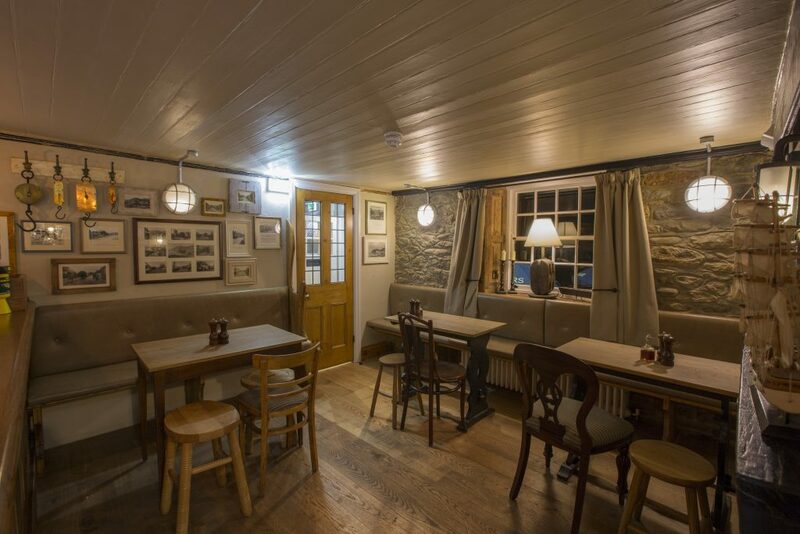 Being such a large site, it was important to consider the privacy of patrons: wooden half-height dividers and semi-private tables ensure that customers never feel exposed, and preserves the cosy feeling of traditional pubs during evening service. 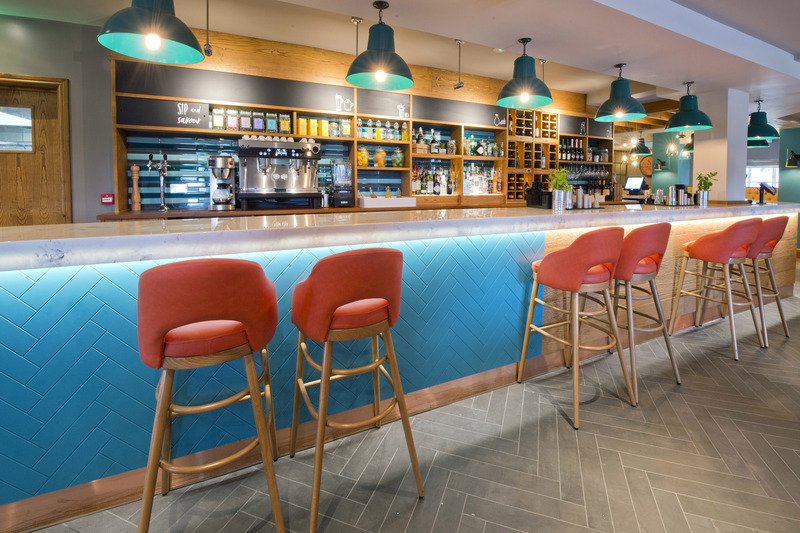 Perhaps one of the most impressive features of Cookhouse and Pub is the sheer scale and style of its 41-cover bar, topped with stunning marble and split-clad in blue herringbone and natural wood paneling. Copper makes a decisive appearance both in the main bar and the counter of the open kitchen, adding some subtle metallic accents to the interior. 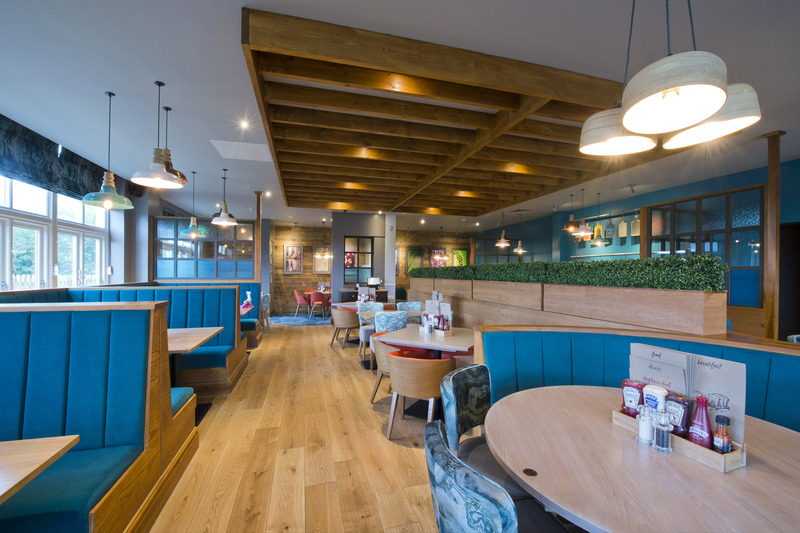 Of course, this is just the first of four Cookhouse and Pub sites opening around the UK, and we’re looking forward to unveiling the interiors for the other locations! In the meantime, check out the full gallery of photos here. 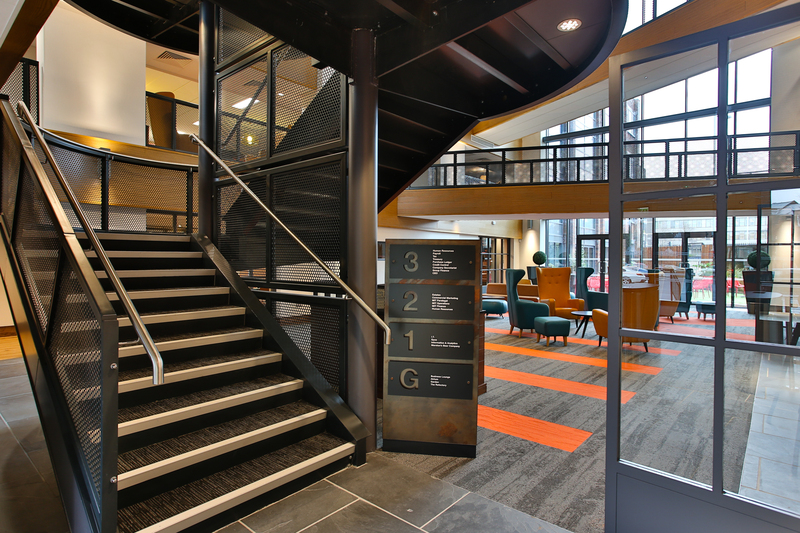 Marston’s House has received a National Commendation in this year’s BCO awards, coming second place in the Corporate Workplace category after having won the West Midlands and Central England Regional Award previously. 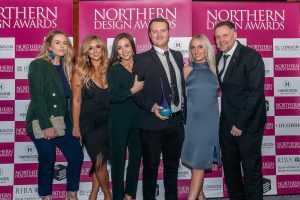 Everyone at team JMDA is so incredibly proud of this achievement, which marks the culmination of an exciting project and what was a fantastic opportunity in working with the Marston’s brand. 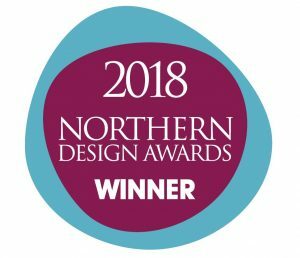 The calibre of design on show at the BCO awards was incredibly high, so for our own work and the work of all the other talented people involved in Marston’s House to be recognised like this is a true privilege. As such, we have every plan to turn this energy towards even bigger and better things in our upcoming projects! Our concept for the Marston’s House – which was designed alongside fellow studio Newman Gauge – was of an interior that was sleek, modern, and above all practical, but which also upheld and took inspiration from the rich tradition of British pub style. 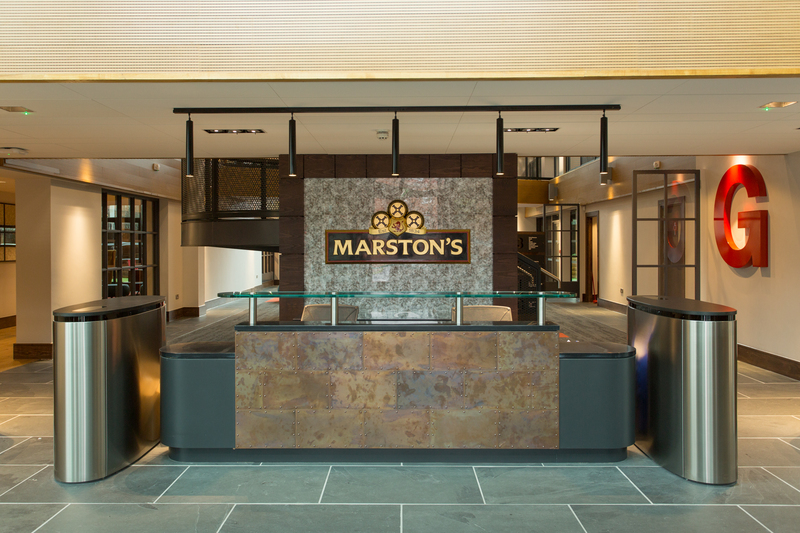 As a brand name closely associated with British pubs, it was crucial that the heart of Marston’s operations reflected that spirit, while providing an elegant workplace with plenty of room for creativity and innovation. 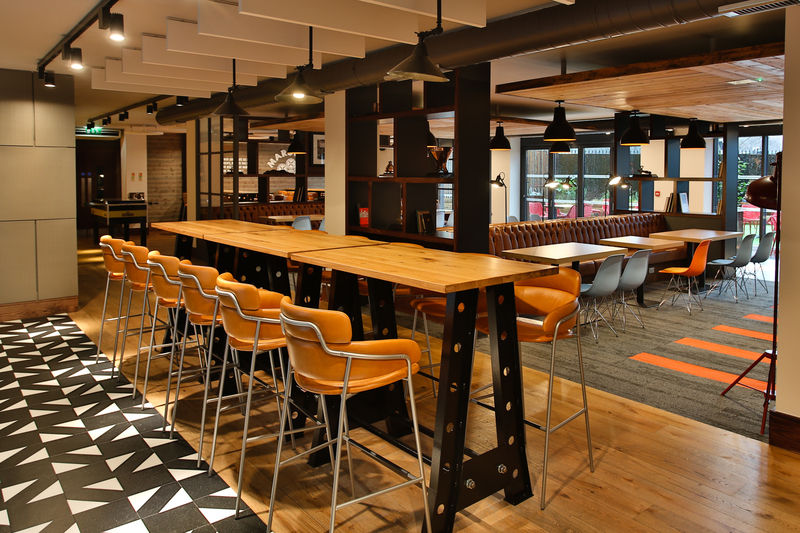 JMDA delivered on this with vast break rooms, light and airy spaces, and a warm colour scheme based on the natural tones of the rustic pub image. 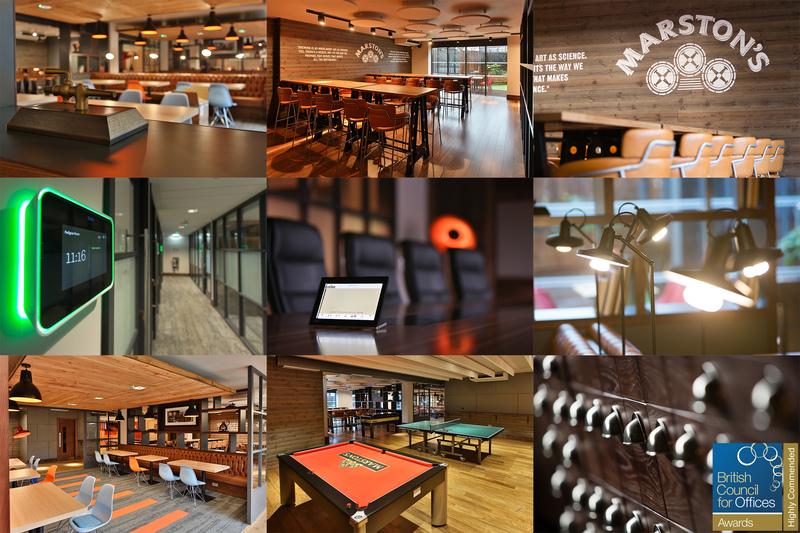 Most of all, we’re proud to have created a flexible and comfortable work environment that will be on-trend for years to come. It’s only been a few months since we started Design Spotlight, but it’s already finding its feet as a long-term part of JMDA. That said, the emphasis is still on ‘finding its feet’. We’re very much working through the best ways to ensure it’s a quality blog, delivering quality content. That’s why, after some deliberation, we’ve decided to make the move to Medium. It’s a better environment for our blog content, and as we’ve started to take a great deal of interest in Medium as a platform, it carries the enormous benefit of being able to interact with other creators. As such, all of our previous Design Spotlight blogs have been migrated to Medium, and you can still read them on there. News and announcements will still be posted here but, if you want to keep up with both, you can rely on our Twitter and Facebook pages for access to all the latest from JMDA. Finally, we’re happy to announce a new blog post – our first Medium piece – coming on Monday! We know it’s been a while, but this one is very much worth the wait. She’s small, but she’s exceptionally powerful. 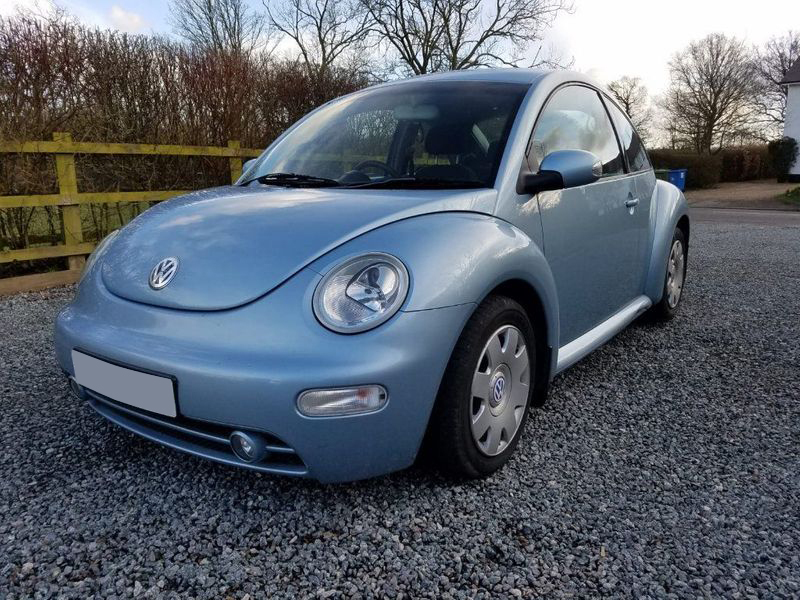 Meet Bluebell. 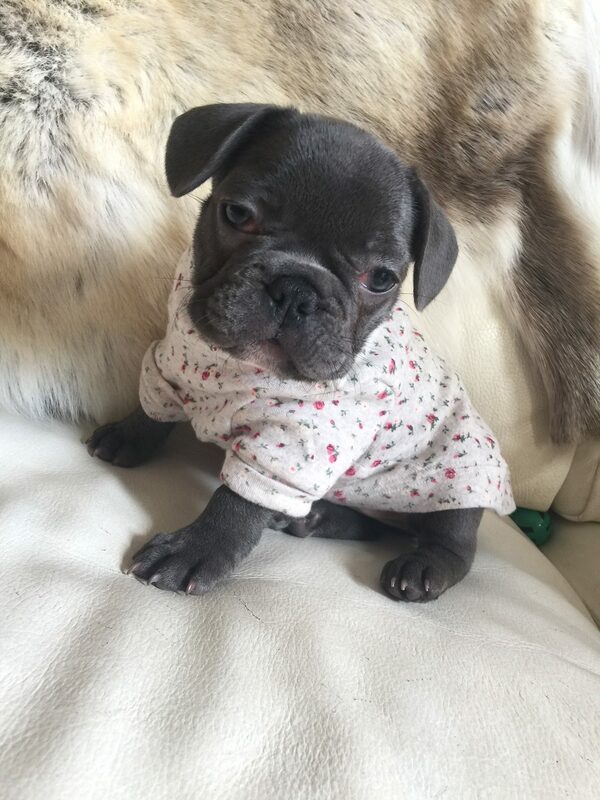 Some of you may have seen this little angel on our Instagram feed a few weeks ago, but for those that missed her, this is Bluebell! 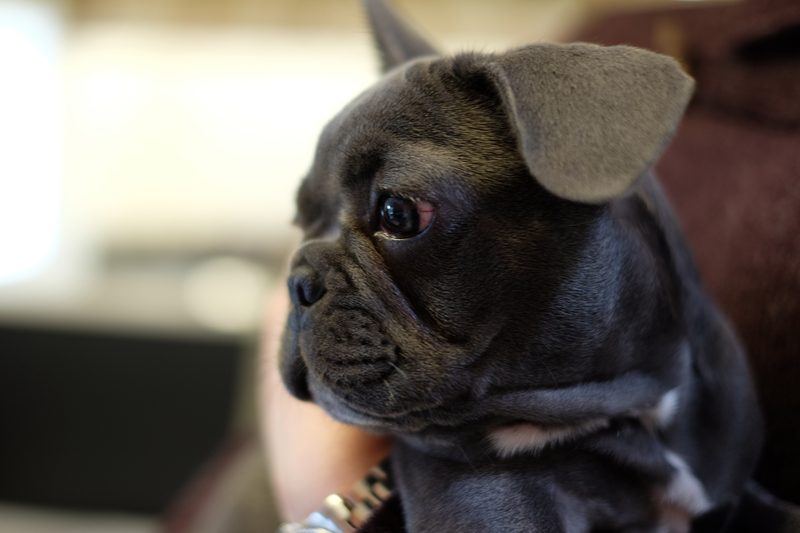 As the company’s Morale Officer, she’s performing a range of valuable tasks, such as lighting up the room, providing moral support, sleeping, and just generally being adorable. 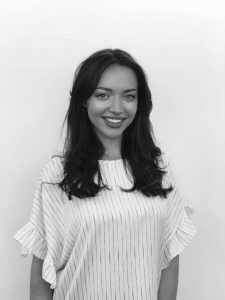 When interviewed about her new role she declined to give comment, but we’re thrilled to be adding her expertise to the team, and we’re fairly certain she feels the same about working with us. It’s a valuable learning opportunity and we hope to better ourselves by following Bluebell’s example. 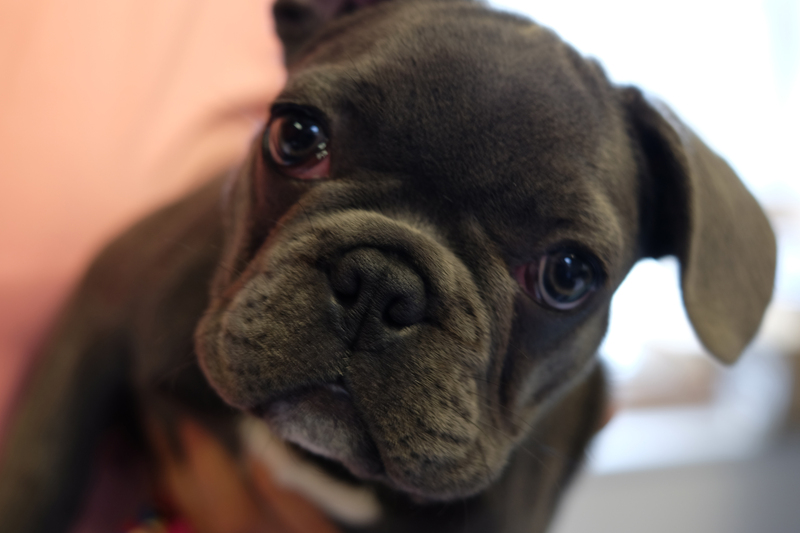 So, keep an eye out for this tenacious pup popping up on our social media feeds from now on! 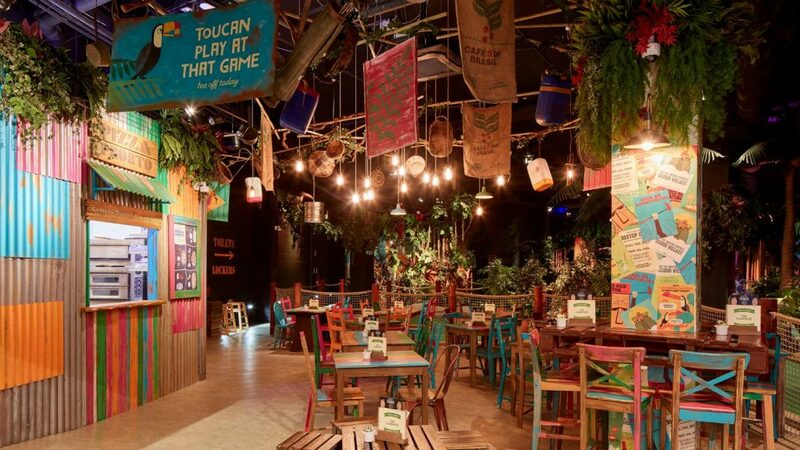 Quirky bar and restaurant chain The Alchemist has really been pushing the limits of commercial interior design lately, and their newest location in MediaCityUK is no exception. 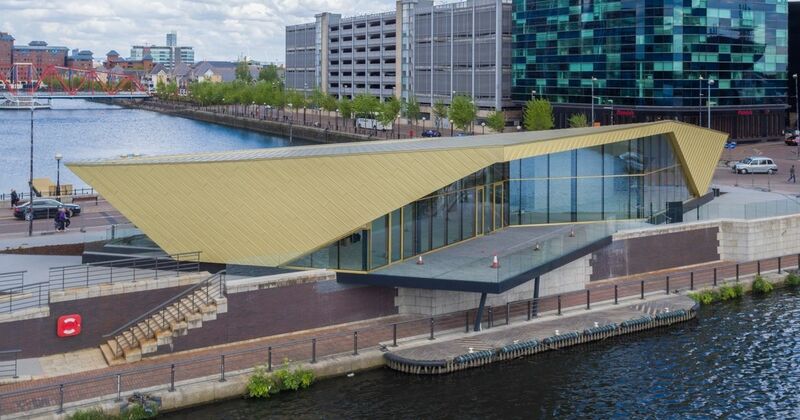 Recently landed, the gold-panelled building nicknamed the ‘spaceship’ sets a distinctive silhouette on the Manchester Ship Canal, and offers stunning views of one of the UK’s most impressive metropolitan centres. 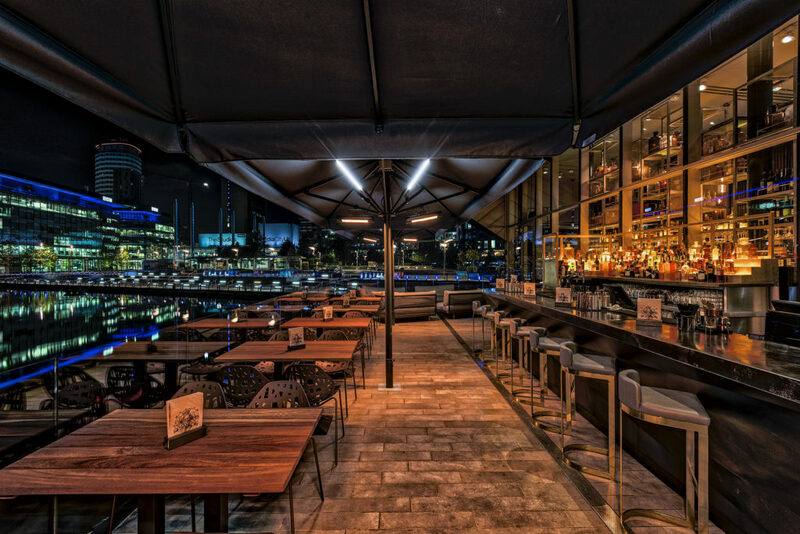 Five years in the planning, the Alchemist’s latest venue brings an unexpectedly contemporary and space-age feel to a brand that has been largely built on the dark charm and mystique of the ‘molecular mixology’ image. Though the interior still features plenty of dark wood and leather, the bright gold of the exterior is matched inside with metallic trimming, bringing sparkle and a touch of on-trend drama to the space. With an outdoor bar and enormous windows to boot, the space feels airier; lighter; more casual than other Alchemist locations. 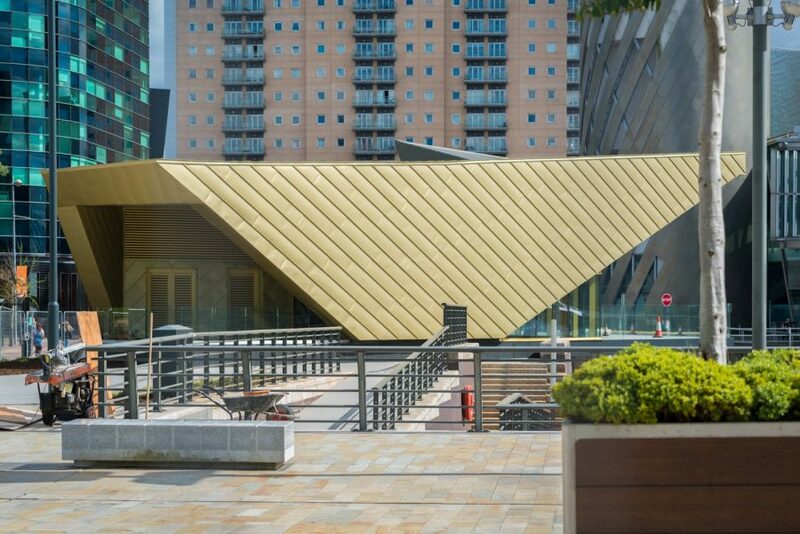 Of course, the exterior, too, is an impressive feat: though the building’s striking gold shell is a daring piece of architectural design, it’s remarkably at home with the aesthetic of MediaCity, and creates a bold and contemporary statement befitting this area of Manchester. 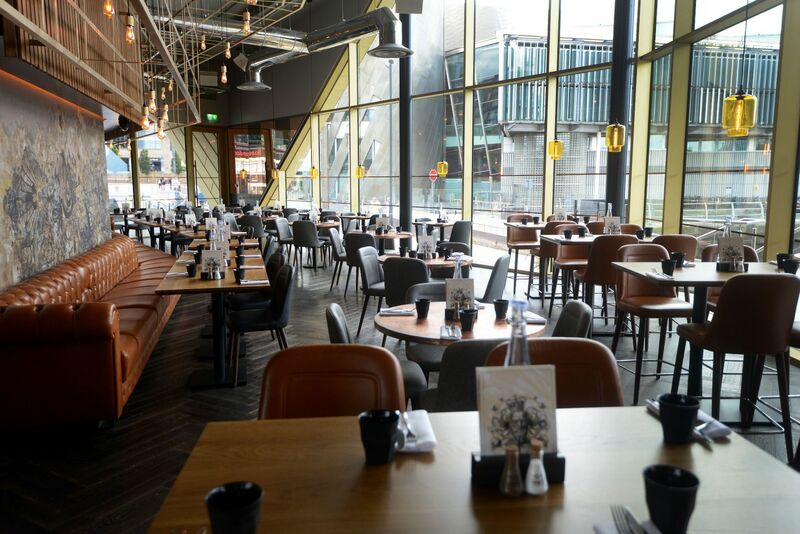 We were nonetheless surprised by how different the MediaCityUK location is to the Alchemist’s other sites. The self-aware moodiness and edge of the Alchemist has always been a part of the brand’s aesthetic, with subtle hints of period and even some steampunk influence. 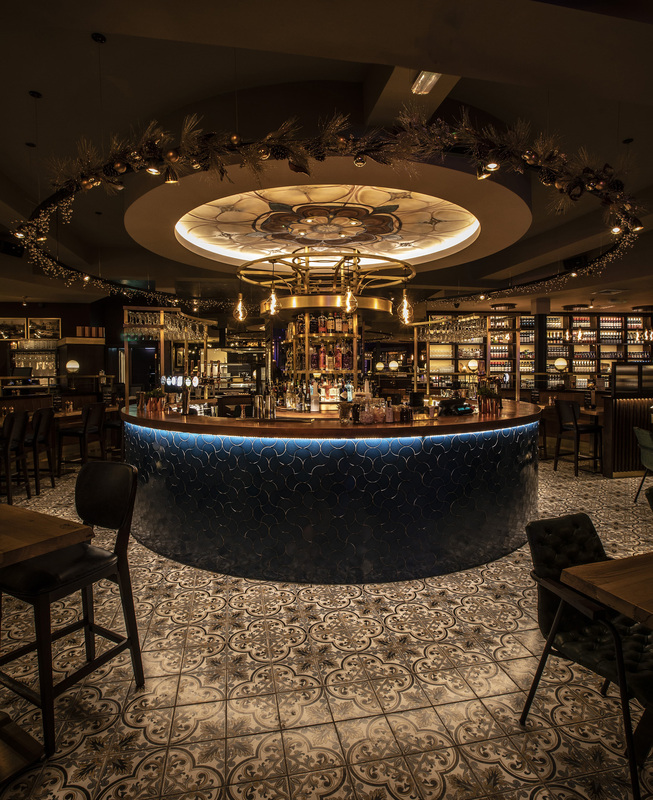 While by no means absent from this newest iteration, we felt that the Alchemist had toned down some of these qualities for the MediaCity location, resulting in a stylish compromise between contemporary design and the Alchemist’s signature rustic-fantasy. What struck us most was just how magical the bar looks at night: there’s really no way to recreate the perfection of the new location’s waterfront setting. Whether this marks a new direction for their interior style or is simply a one-off intended to match the aesthetic of the building, we can’t wait to see where this exciting brand goes next. One thing’s certain: it’s sure to be impressive. Find out more about The Alchemist at MediaCityUK here. This week we’ve been inspired by the recently-unveiled refurbishment of the Glade, Sketch’s own breakfast and brunch bar, which has taken a turn for the magical! 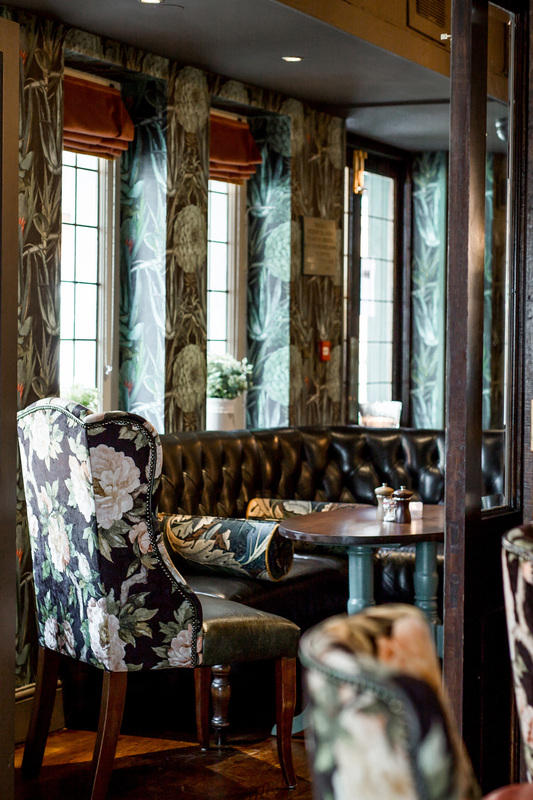 JMDA designer, Lauren Milner, offers her take on the fabulous new look for the bar, and how it’s inspiring her in preparation for delivering on-trend schemes for the UK pub scene. 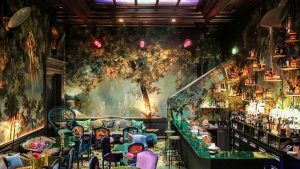 Sketch London’s iconic pink restaurant might have featured in every designer’s Pinterest board over the past few years, but this summer the focus has shifted to the location’s breakfast and brunch room, the Glade. With this new refurb, it’s gone for a darker feel: winter is coming, inspired by fairy-tale forests and bejewelled with iridescent colours. With design tastes shifting at this time of year, we’re feeling the autumn hues and mystical vibes, so it’s certainly ticking all of our boxes. 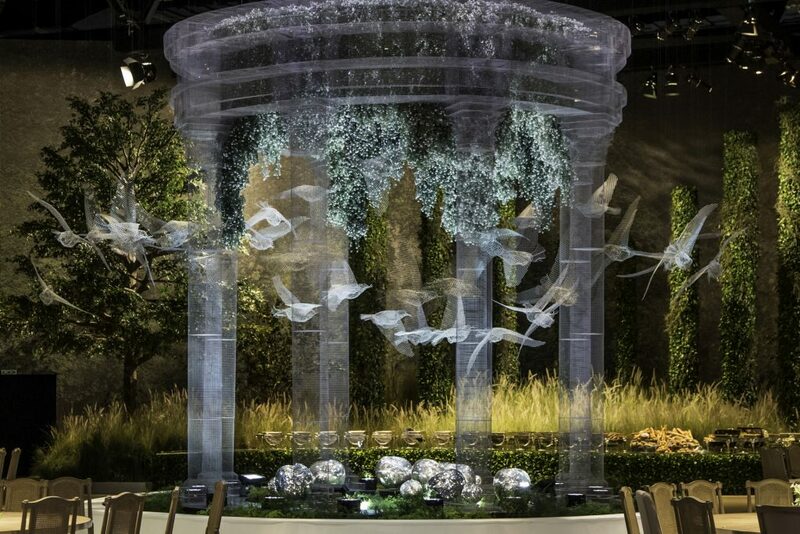 Of course, it’s no surprise that the Glade really resonates with Lauren’s current design inspirations. Autumn and winter are my favourite seasons. The change in season sees a new warmth in nature: trees become bare and reveal earthy tones, textured bark, and crunchy leaves underfoot. Early evenings feel authentic; cosy—think orange glows of bourbon, textured jumpers, leather boots and big scarves (big scarves are my fashion go-to in winter!). Meanwhile the early draw of darkness really feels mystical and moody. My current design style is textures; jewelled colours that embrace a darker side; those moody ‘winter’s night’ vibes; abstract artwork… the ‘enchanted forest’ look with autumn inspiration and a feminine touch. Most importantly I’m not afraid of colour, or the collaboration of textures and patterned fabric… all of which could be loosely described as ‘girl meets boy’ – feminine with edge! Find out more about the Glade and Sketch here. Cars might not immediately spring to mind when you think ‘interior design inspiration’, but this week at JMDA we’ve been embracing the intersectionality of the design world, and appreciating some of the most innovative new concepts designed for the motoring industry. It’s an exciting time to be connected to the rest of the design world (well, when isn’t it? ), and we’re seeing some truly remarkable explorations of the practice in a range of different sectors. Car concepts are no exception: the rise of new motoring technologies isn’t just what’s on-trend right now; it’s forming a new turning point in the history of the car. Electric and hybrid fuel systems, self-driving, and materials advances are making real the sorts of cars we’d previously only dreamt of – perhaps somewhat jokingly – in science-fiction artistry. It’s no surprise then that this turning point is impacting more than just what lies under the hood. As practical concerns shift, so too do design principles: car companies might not be seriously designing flying cars just yet (well, mostly), but we’ve been intrigued by some innovative new concepts that push the boundaries of automotive design. Rolls-Royce recently unveiled a new feature of the new Phantom VIII: the “Gallery”, a customisable dashboard panel that can be personalised to each individual owner’s specification. It’s a luxury reserved for the elite of the elite, and to give you an idea of the market Rolls-Royce are targeting, one of the display options is a 24-carat gold-plated panel etched with a visualisation of your own DNA sequence. There are less hedonistic options, but the Gallery is nonetheless an expression of extreme individuality; an indelible marker of uniqueness. It’s also perhaps a precursor to the trend of customisation being more extensively applied to automotive design. 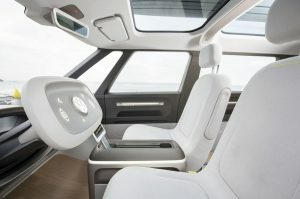 As services – and indeed, interiors – aim to offer a more bespoke, unique experience for consumers, it’s only logical that cars would begin to follow suit. The discussion on how designs cater to individuality is a fascinating one, and it’s one we’ll certainly be keeping an eye on. This new concept by Mercedes is perhaps the most conservative example of future-facing car design we’ve picked, but that’s not to take away from how stylish it is. 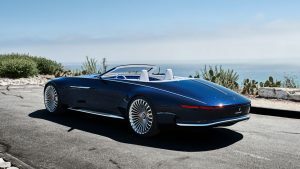 Masterfully elegant in spite of its enormous dimensions (almost six metres long), the Vision Mercedes-Maybach 6 Cabriolet is a modern realisation of classic luxury car design, complete with a nu-art-deco body. 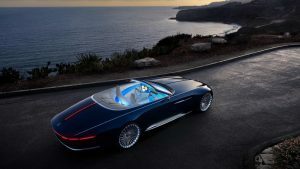 The concept even draws on analogues of other timeless styles, and we couldn’t help but see more than a little Riva speedboat in the car’s sleek rear and gunwale. Yet the nostalgia of the Vision Mercedes is only skin deep: under the hood, it’s completely electric-powered, and the cockpit-like interior hosts an array of high-tech instrumentation. It’s a car that dares to reimagine past design conventions augmented modern innovations. More broadly, it’s part of a trend of retro-futurism that’s been on the rise in recent years, and it speaks to the timelessness of designs that hinge on simplicity and understated elegance. 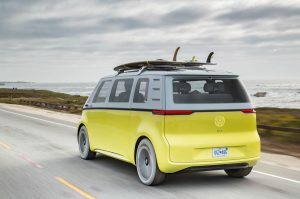 Recently confirmed for production, this electric-powered concept car perhaps most notably boasts a self-driving feature which Volkswagen aim to implement by 2025. 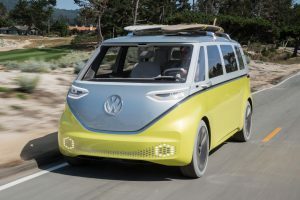 It’s a very modern reimagining of the classic Camper Van look, with a two-tone paint scheme that calls back to the original Microbus with a colourful contemporary palette. It’s another fascinating exercise in reinvention, but what most intrigued us about this car was how it makes use of self-driving. When the steering wheel is pressed back into the dashboard, the car becomes a mobile interior: mood lighting replaces the usual lights, and as a room in its own right, we could see spaces like this being personalised as custom car interiors become more widespread. It’s exciting to consider how the I.D. Buzz could be utilised as a mobile lounge or meeting space without having to consider the need for space for a driver. Though it may be a futuristic reimagining of the Camper Van we know and love, it’s also more than simple nostalgia: the I.D. Buzz is a genuinely practical new innovation which, unlike the Phantom VIII and Vision Mercedes, will no doubt be more accessible to the majority of the market. 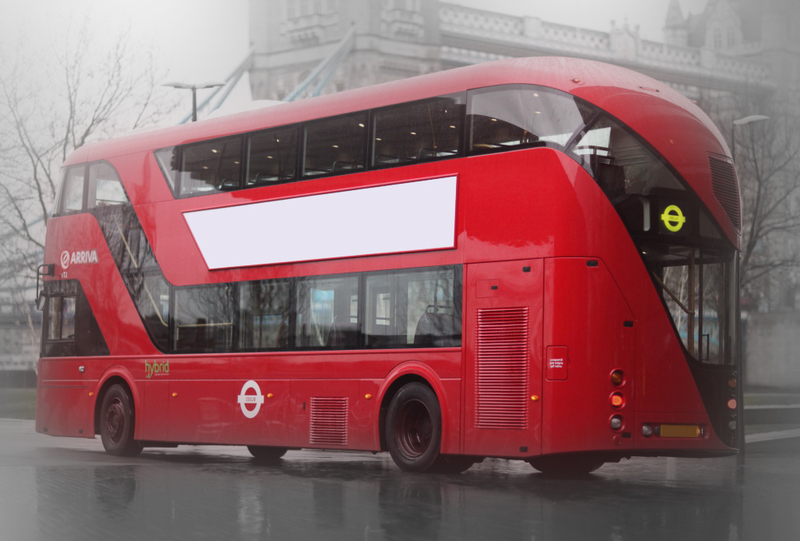 At the very least, it’s a design with some promising prospects in finally bringing self-driving to the market. Let us know what you think – do you reckon we might be seeing all three of these cars on the road together someday soon? Can you see self-driving technologies steering the course of car design? Or is it all just more marketing hype? 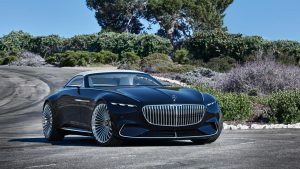 Images from Mercedes-Benz, Rolls-Royce and Volkswagen. 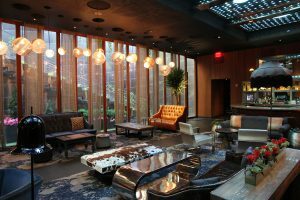 When it comes to hotel interiors, few make as bold a statement as Dream Hotels, and as JMDA has first-hand experience of Dream’s Downtown New York City location, we’ve been avidly following their projects for more great inspiration. As such, we thought we’d take a look at their latest new location: Los Angeles, California. Downtown NYC. To walk into the lobby is to step into a menagerie of colours; patterns; textures. Every piece of furniture is unique, but leather abounds, lending a glossy chic to the comfortable, airy space. The room embraces the lobby as lounge, and could easily double as an evening retreat in its own right. But it wouldn’t be a Dream without a touch of drama, and even quirkiness: the ceiling is transparent, allowing a tantalising glimpse of the pool above, and the wall-mounted flag of the USA is, on closer inspection, made up of old cans. 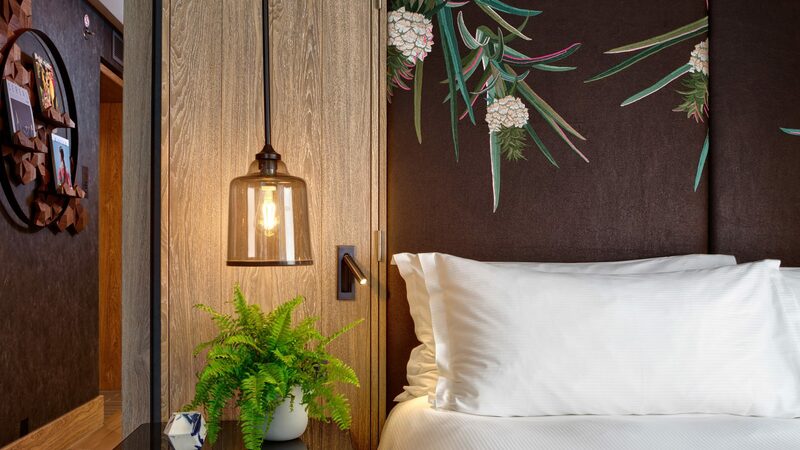 Aside from being immediately impressive, the room is a microcosm of the Dream Hotels’ brand: a style built on the uniqueness of each location, and reflected in every room during our stay. 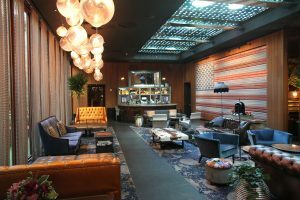 As such, we were impressed with our time at the Downtown NYC location. Very impressed. Once-in-a-lifetime impressed. And we were hungry for more design ideas, especially the make-or-break bold ones that seem to crop up in Dream hotels. So when we heard that there was a new location opening in Hollywood, we were excited for what a new Dream Hotel would do with this iconic area. Unsurprisingly, Dream Hotels know best how to make use of their locale. 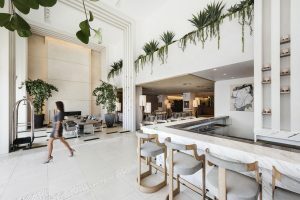 Dream Hollywood’s open-air lobby brings LA’s sunshine inside, and looks stunning in gleaming white marble and clean, smart surfaces. 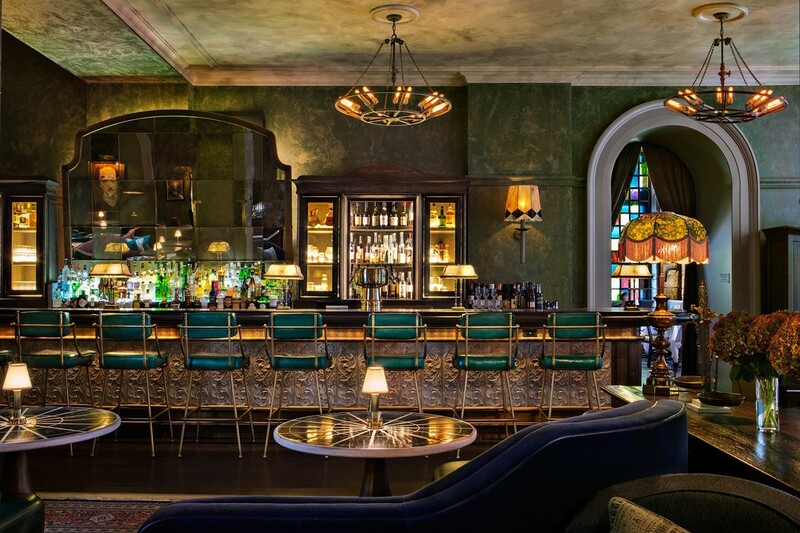 An all-day coffee bar makes it a consistent draw, and there’s a real charm to spending time here: like Dream Downtown NYC, the lobby is re-cast as a lounge in LA’s unique style. 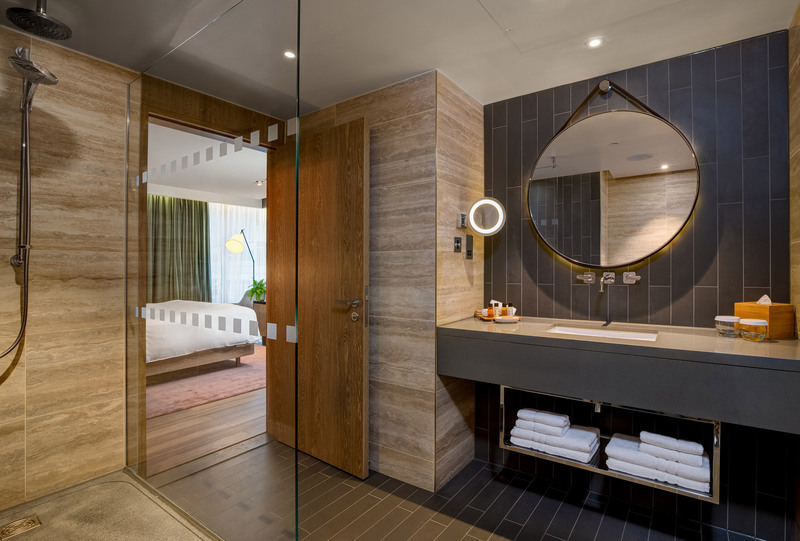 Venturing deeper into the hotel, the décor takes on a more subdued tone, with moodier lighting in the elevators and corridors, giving a sense of cool relief from the unforgiving sun in the streets outside. Wood panelling takes over from bright marble, ushering in a distinctly playful and retro feel. Emerging into the rooms themselves, we found ourselves almost overwhelmed by the sudden influx of light and wonderful views provided by Dream’s full-height windows. 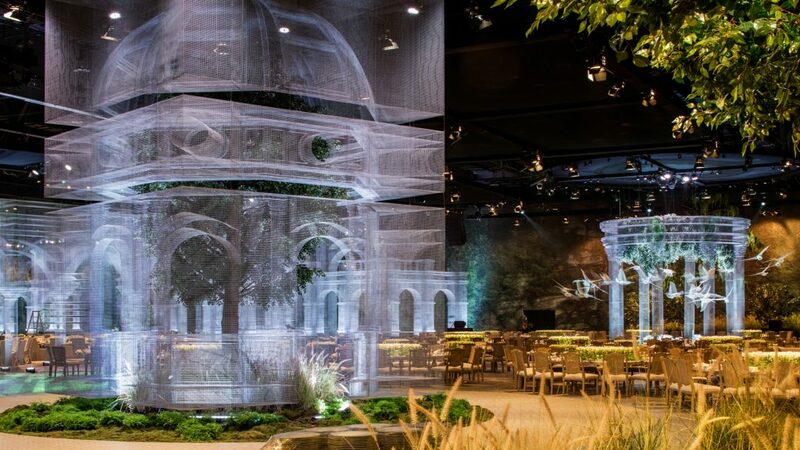 Dream Hollywood takes the approach of bringing the outside inside: it’s a simple and spectacular use of the location’s natural beauty, and one that pays tribute to Hollywood itself. As such, the furniture here takes a clean, understated approach, careful not to overshadow the dramatic LA cityscape. But the bedrooms aren’t the only areas that make use of Dream’s fantastic views, and the rooftop itself plays host to a spacious bar and garden. 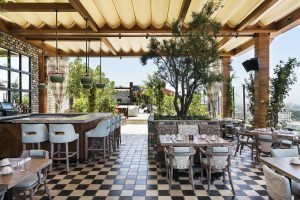 There’s been a definite trend in designing urban rooftop spaces lately, and we’re glad to see that the Dream seizes on this in turning their roof into a vibrant evening space. The grill area here, The Highlight Room, features a restrained checkerboard-tiled floor and grungy brickwork, which give the venue a very casual feel, and make it a prime location to spend warmer days in. For other daytime pursuits, the Dream’s pool deck is – as always – a lovely place to relax on, and features a particularly extraordinary feat of design: the pool itself can be raised flush with the deck, turning into yet another space for partying. Exclusive booths are separated from the main pool by drapes, and tropical greenery adds plenty of natural shade. 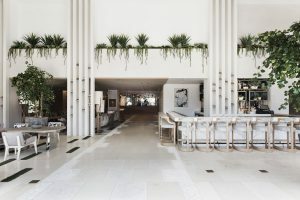 In all, Dream Hollywood did not disappoint: once again, Dream bring a uniquely casual, elegant approach to hotels, while incorporating elements of the local culture and aesthetic into each hotel’s design. Dream Hollywood’s adjustable pool remains one of our favourite features, and though some might call it a gimmick, it raises some interesting ideas about how to make spaces versatile and adaptable. 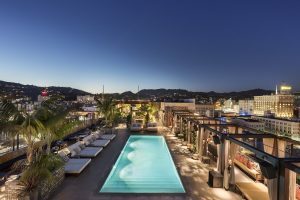 This extends to the hotel’s use of roof spaces, which we definitely felt were in tune with Hollywood – after all, nothing says movie glamour like a rooftop party. So, with plenty to take away from the Dream brand, we’ll be keeping an eye out for more inspired twists on these intriguing design opportunities. Dream Hotel Hollywood and Dream Hotels online. Do Not Adjust Your Screen! The winds of change have been blowing for quite some time here at JMDA: with a new office, new clients, and a shiny new website, it’s certainly been exciting for us! We’ve been hard at work these past few months, travelling across the country delivering excellent interior designs and presenting inventive new concepts – not to mention finding plenty of creative inspiration along the way. On top of that, we’re happy to be welcoming two new designers and a media manager to the team – but there’ll be more on them soon. In the meantime, take a look through the new home of JMDA online: say hello to our team’s new profiles, browse through our gallery of previous projects, and check out our social media profiles – we’re on Facebook, Twitter, Instagram, and more. Plus, you can now sign up to our quarterly newsletter for updates on both upcoming and completed projects. We’re rolling out a new look for JMDA, but some things haven’t changed: our motivation, dedication, and experience in delivering professional interior designs that always leave the client impressed. With growth comes more fantastic projects that we’re looking forward to unveiling, and of course, yet more opportunities and possibilities for the future. So for now, keep your eyes peeled for more developments at JMDA, and we’ll be back with more news soon! This week Team JMDA have been busy down South with new briefings, however we still find the time to be inspired. 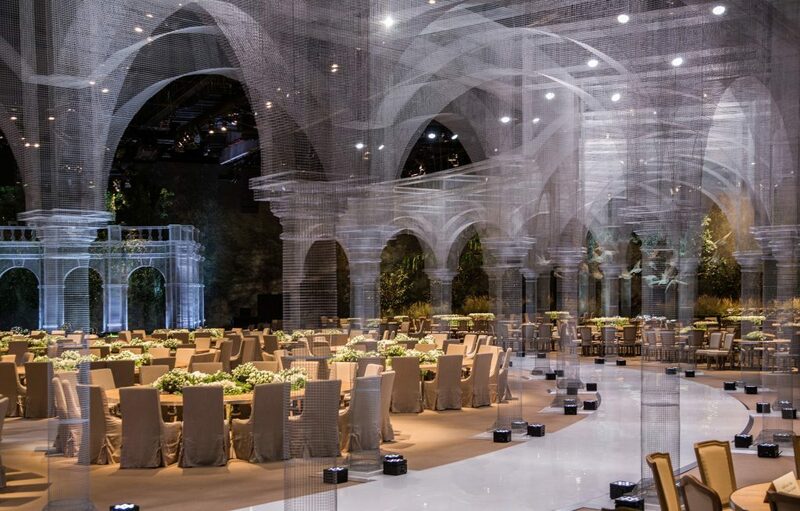 We were particularly impressed by this collaboration between Italian artist Edoardo Tresoldi & DesignLab Experience, who have used steel mesh to create an ethereal modern landscape inspired by classical architectural forms. Let the Leeds adventure begin! We’ve spread our wings and branched out on a whole new adventure! This week JMDA opened their second office in the buzzing city centre of Leeds! The whole team are super exited for the opportunities this will bring and the inspiration that surrounds us. With the four day weekend ahead we thought we would start by checking out some of the local hotspots… have a great Easter everyone! Team JMDA have had an exciting start to this week with our first MAB briefing of this working year. It was an early start on Wednesday morning, travelling down to southern territory to get the ball rolling for our next challenge. Creativity is at a high in the Leeds office as we explore all new colours, layouts and samples which will bring this scheme together! What unique and innovative ideas can we create this time?! Follow our Instagram account for the journeys throughout the next wave of projects we have just around the corner and see how JMDA travel from start to finish within every project! The annual Milan Design Week, one of the biggest events of the design calendar, kicked off earlier this week, promising a flurry of new design collections and immersive installations across all design disciplines. This year IKEA have launched their “Let’s Make Room for Life” Festival inside a warehouse space, which features installations, workshops & talks from the likes of Tom Dixon & Faye Toogood, whilst also offering a behind the scenes look at IKEA’s development process. The Salone del Mobile Milano is the perfect stage to showcase a new collection, acknowledge a milestone in your career or, in the case of Alessi, honour the late great Zaha Hadid with a display of their past collaborations. Whilst we haven’t been able to experience Milan Design week first hand, we have been keeping a watchful eye for inspiration. Meanwhile other members of Team JMDA have been busy travelling to various projects across the country, including handing over the Corner House in Cardiff City Centre for Mitchells and Butlers. P.S. Follow Dezeen, Tom Dixon Studio, Jamie Hayon & Formafantasma on Instagram for more insights into the goings on at Milan Design Week.